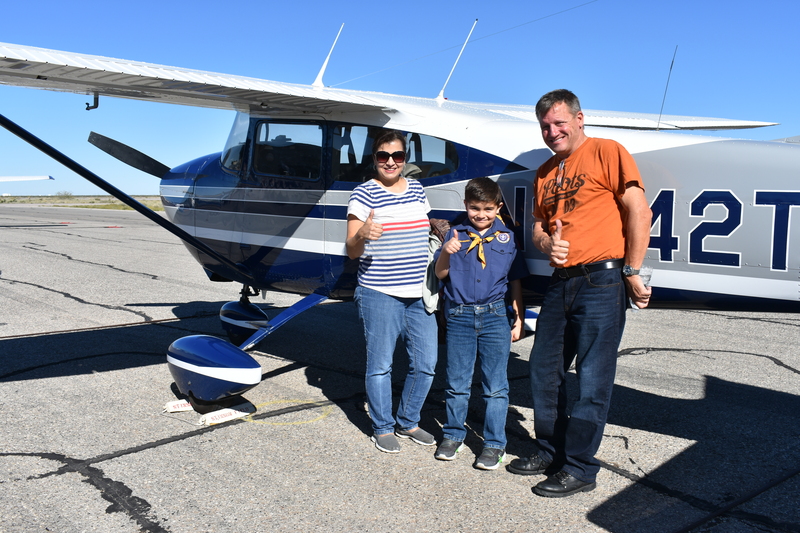 The first EAA Chapter 1570 YOUNG EAGLES FLIGHT for 2019 was sucessfully completed this past weekend. 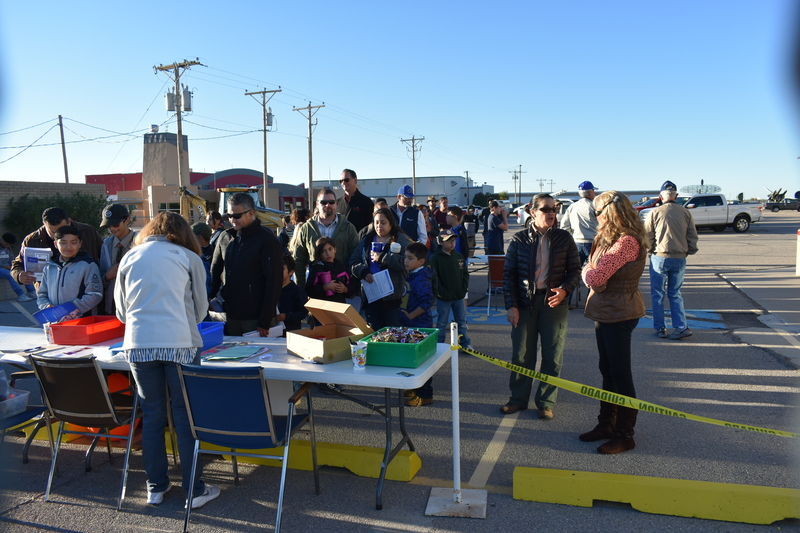 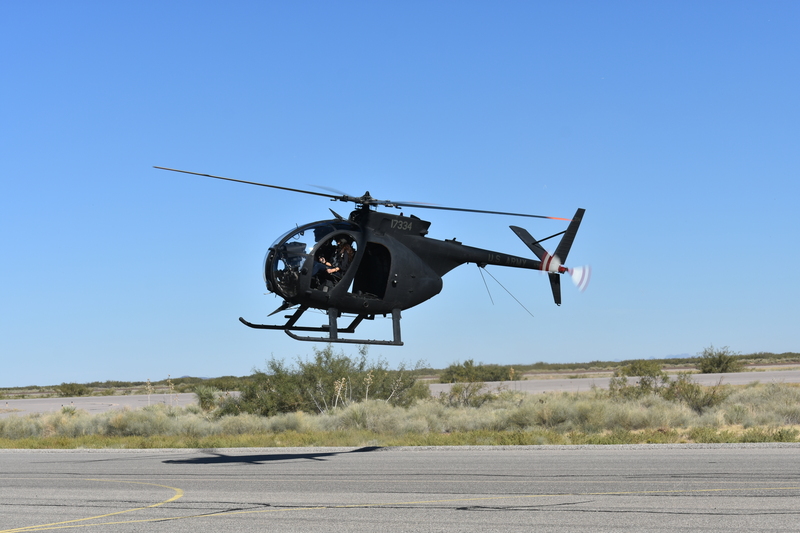 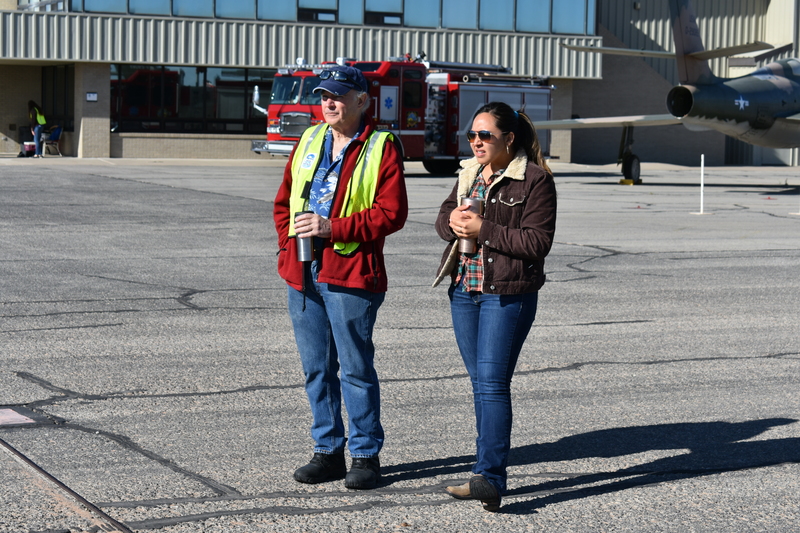 As usual, it was conducted at the Doña Ana County International Jetport in Santa Teresa, NM. 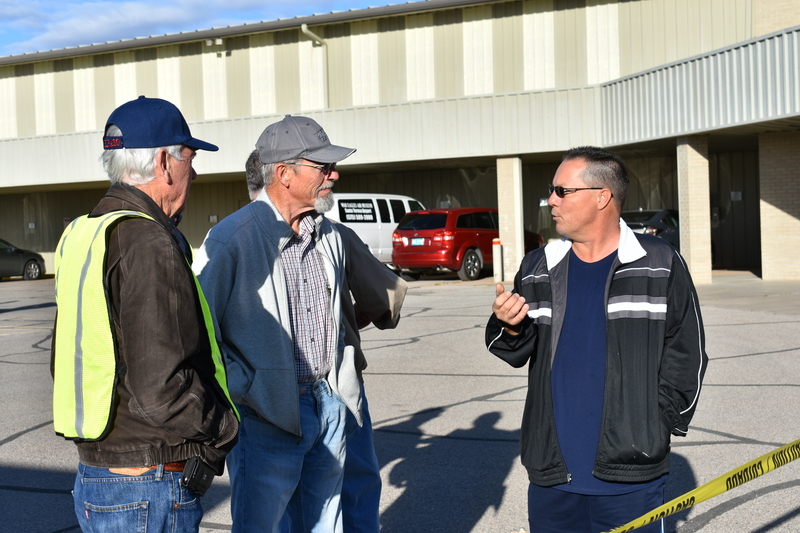 The participants enjoyed the fine facilities of the War Eagles Air Museum (WEAM) for the entire operation. 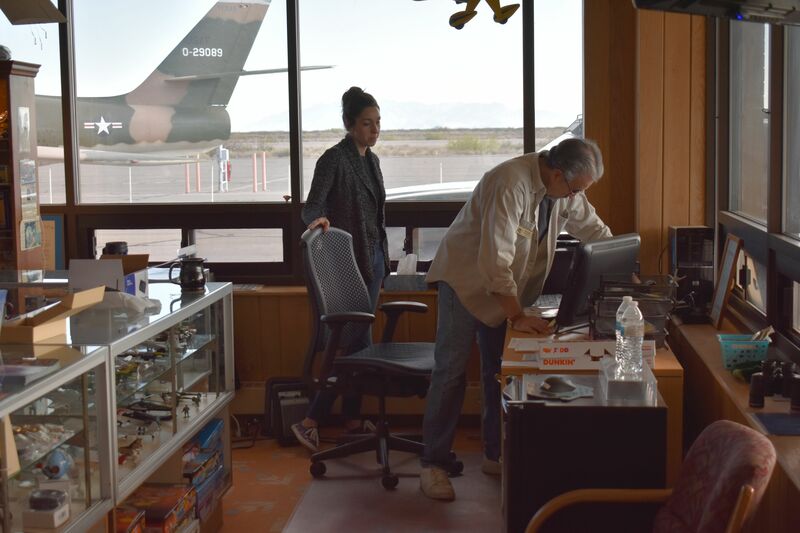 After the event wound down, the volunteers had a lunch and defriefing in the Executive Meeting Room of the Museum. 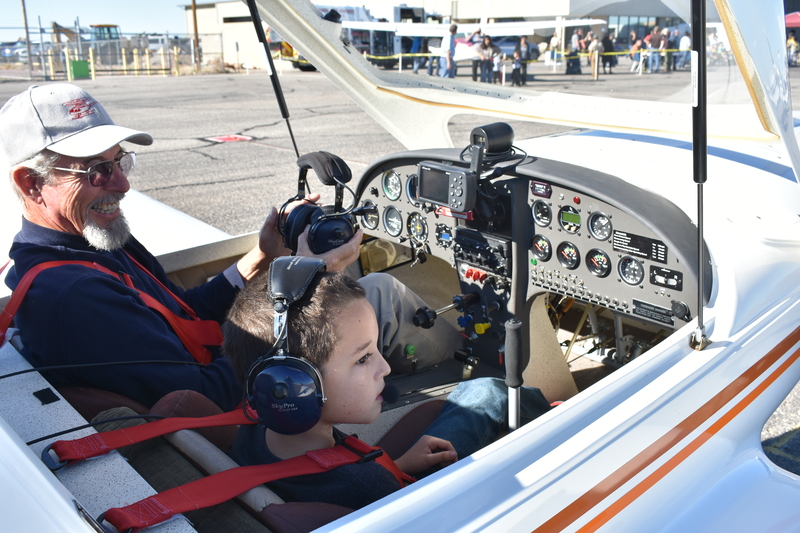 Most of the young first-time flyers were able to enjoy the many WEAM exhibits after their flights. 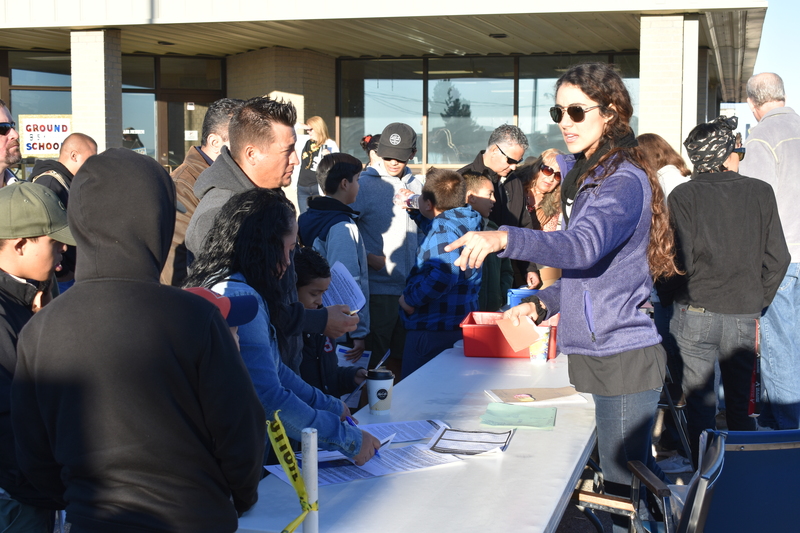 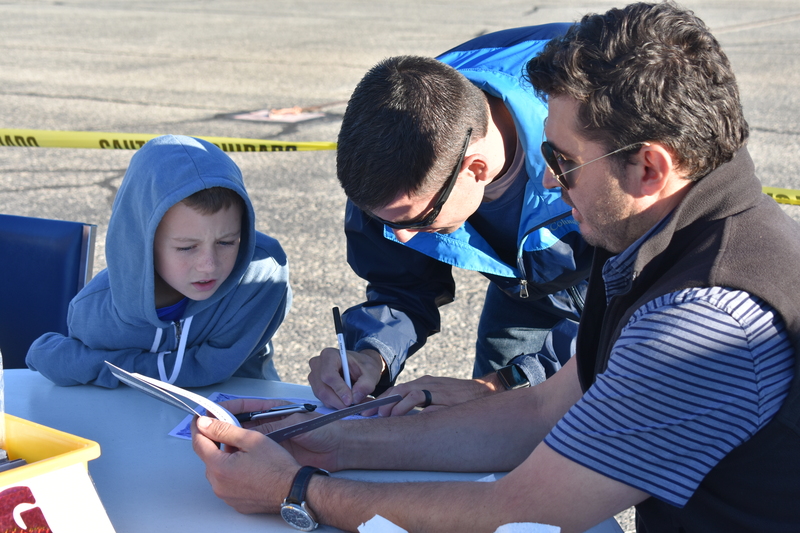 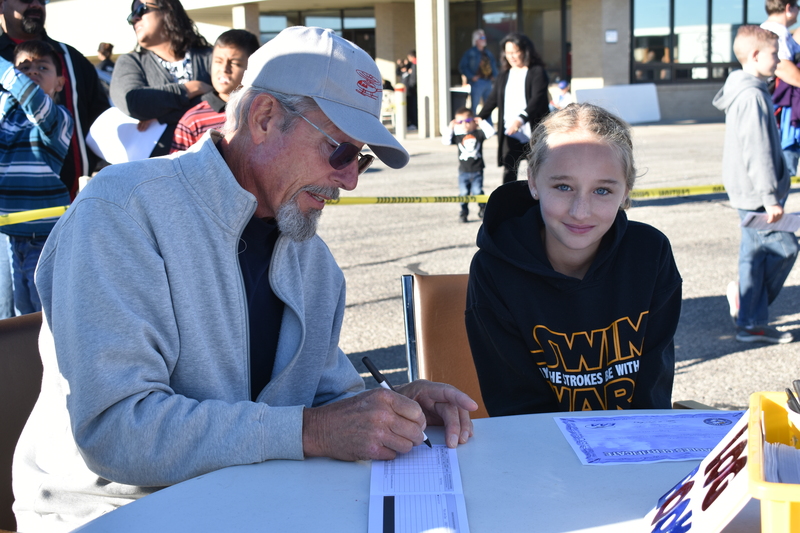 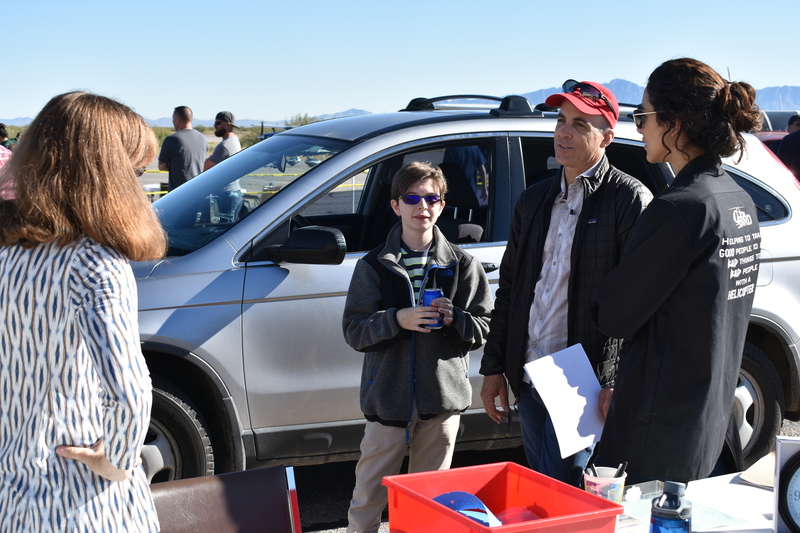 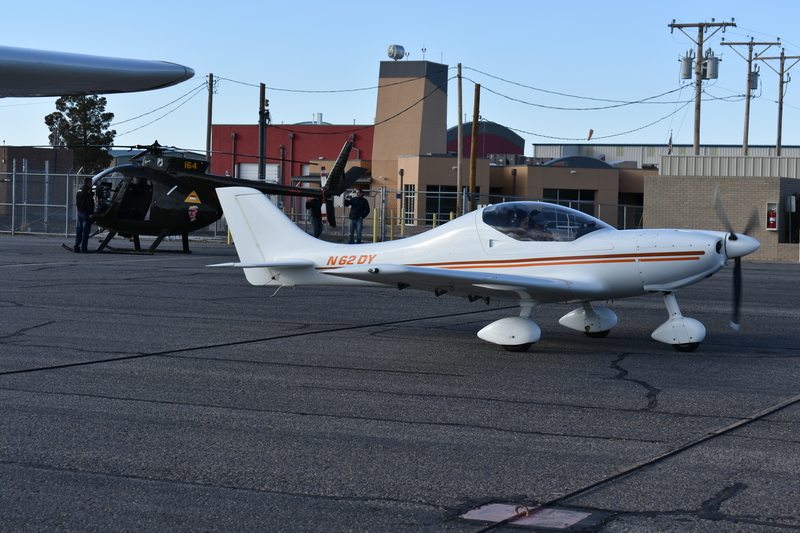 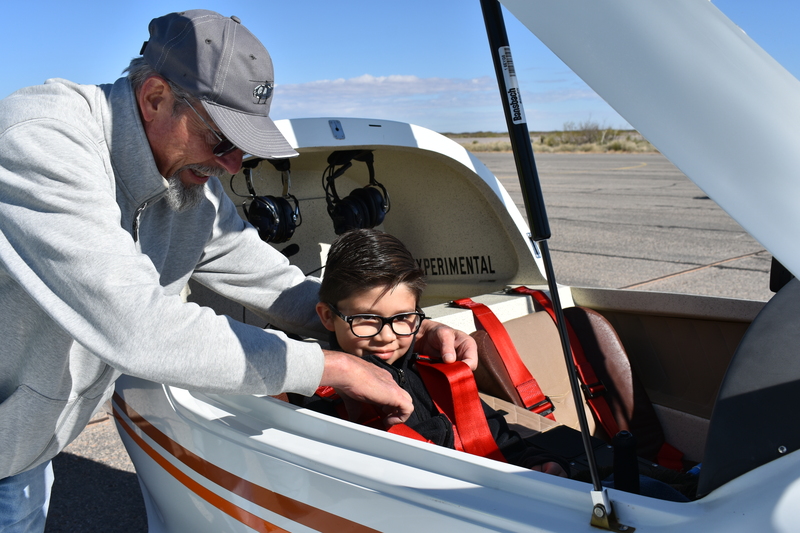 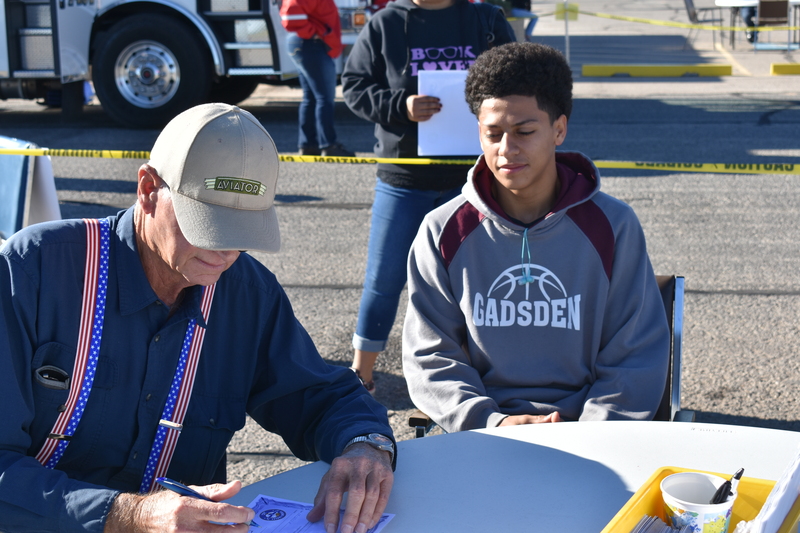 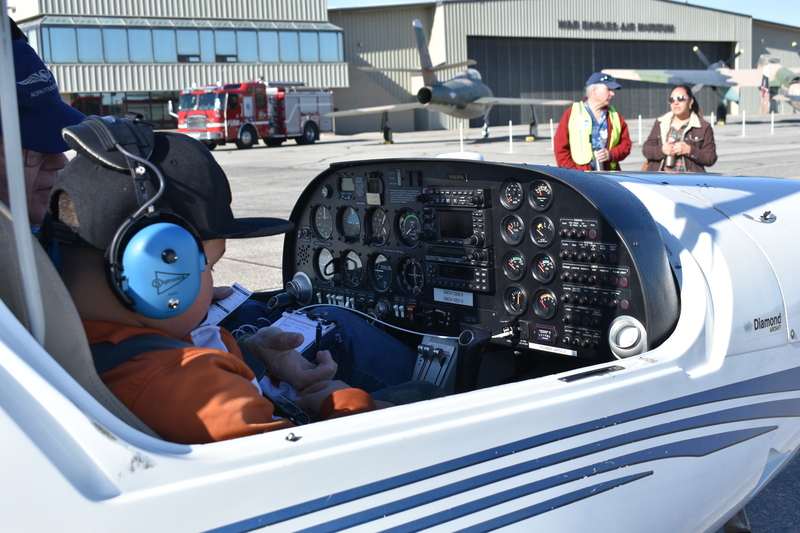 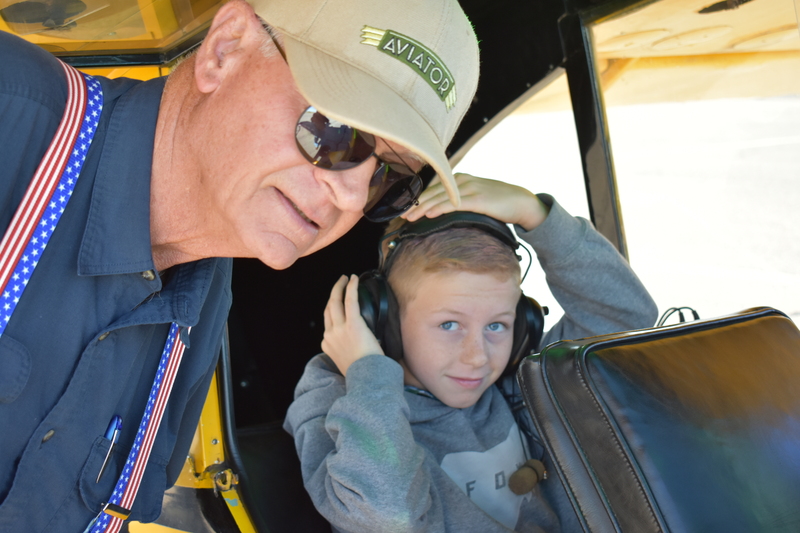 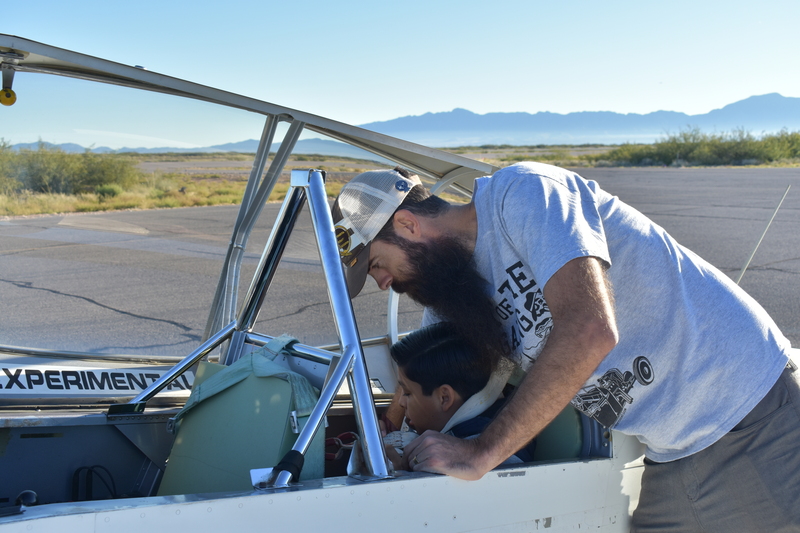 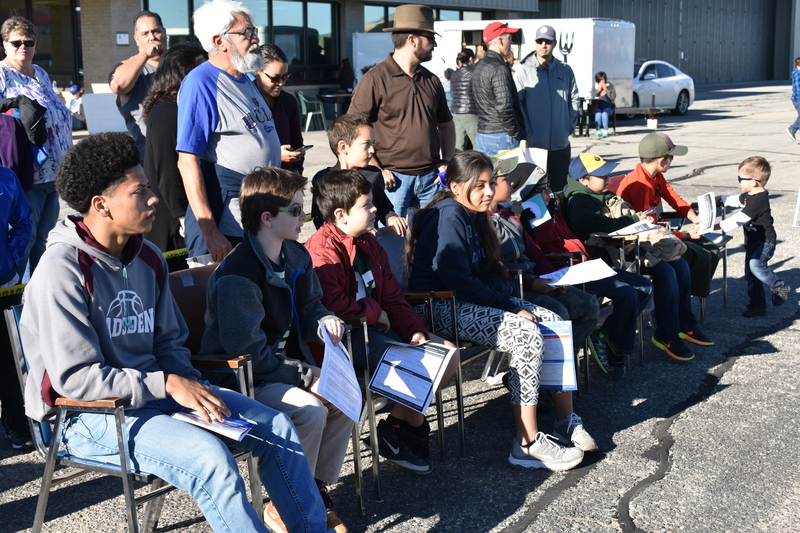 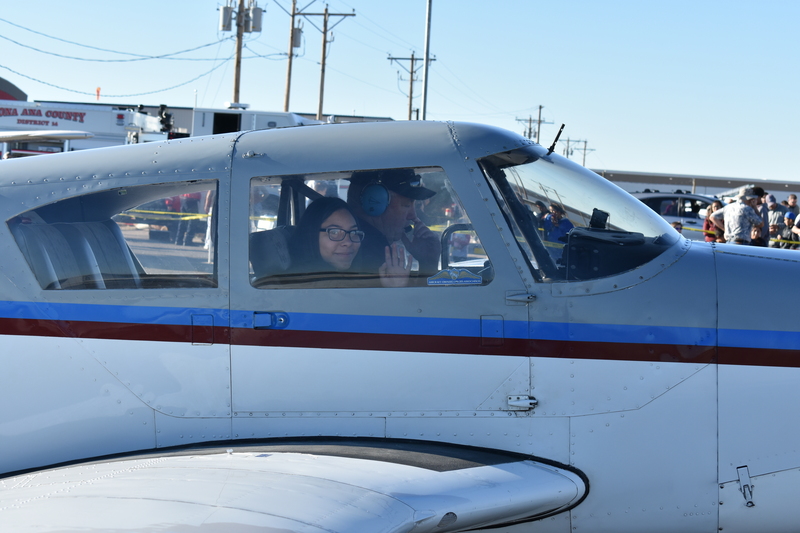 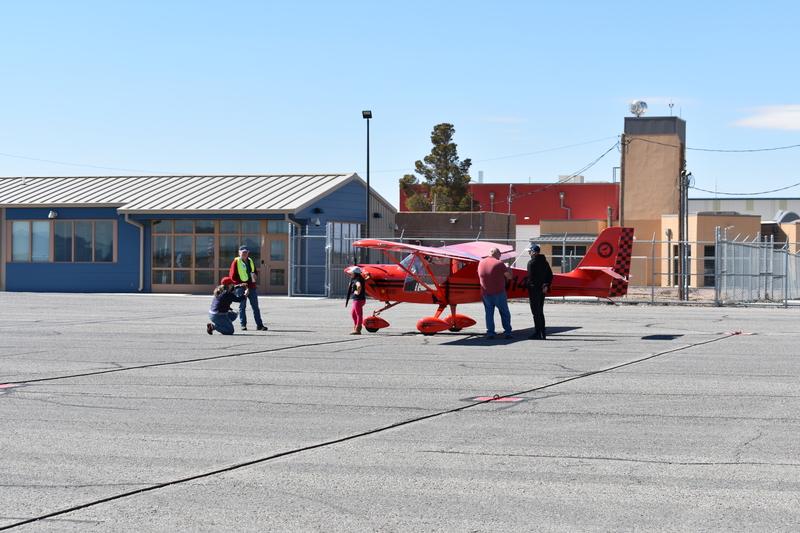 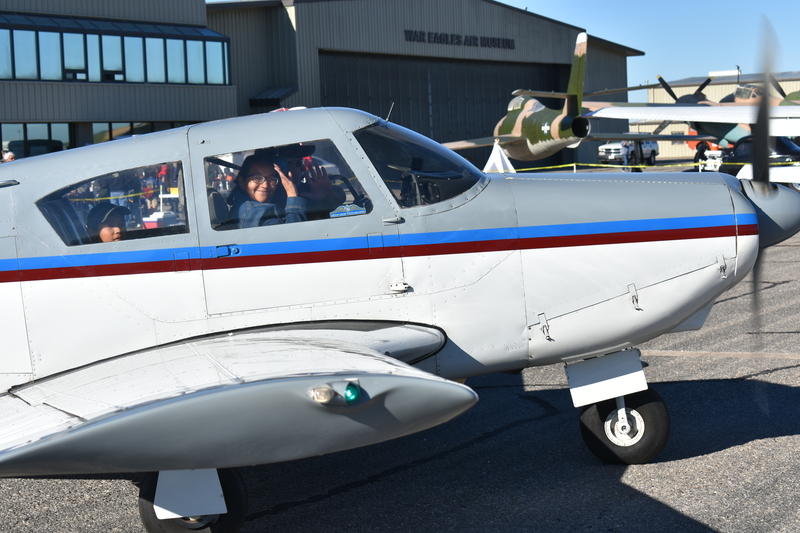 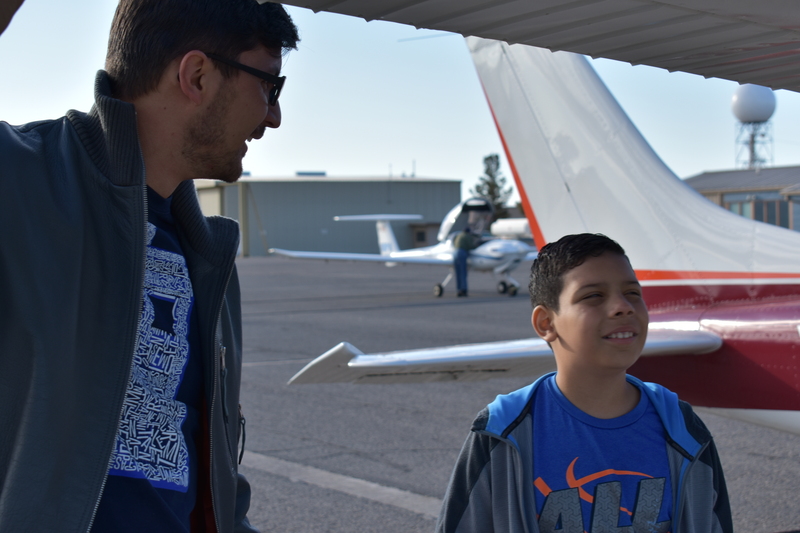 Chief Registrar, Melissa Keithly, reported that the morning session saw 55 new Young Eagles take to the skies for their first introductory airplane flight. 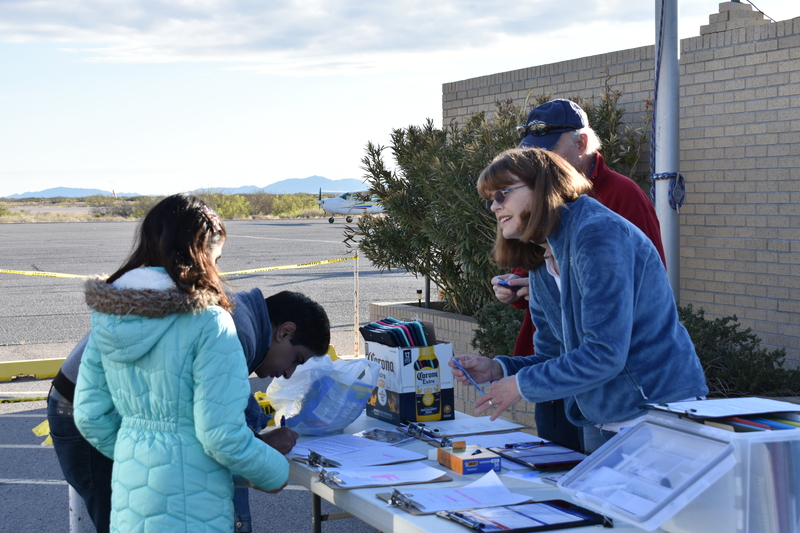 Melissa Keithly busily registering Young Eagles for the day’s first-flights. 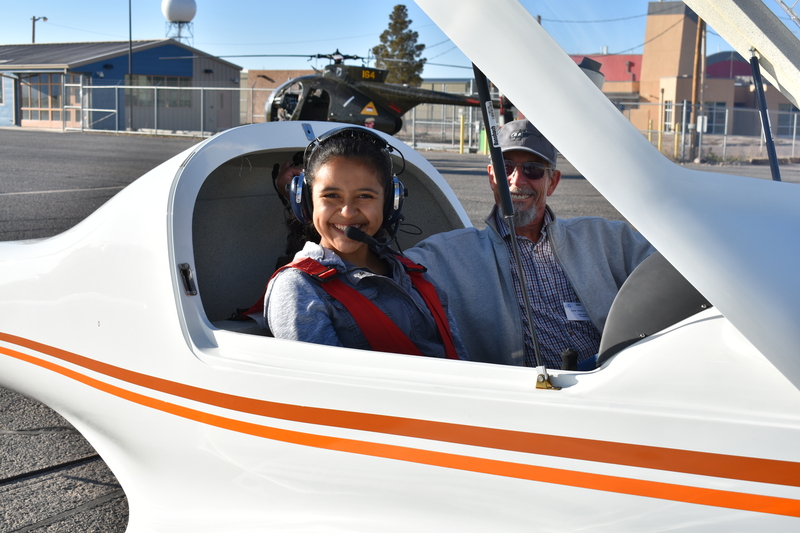 By the noon deadline she had booked 55 young people for their first personal airplane flight adventure. 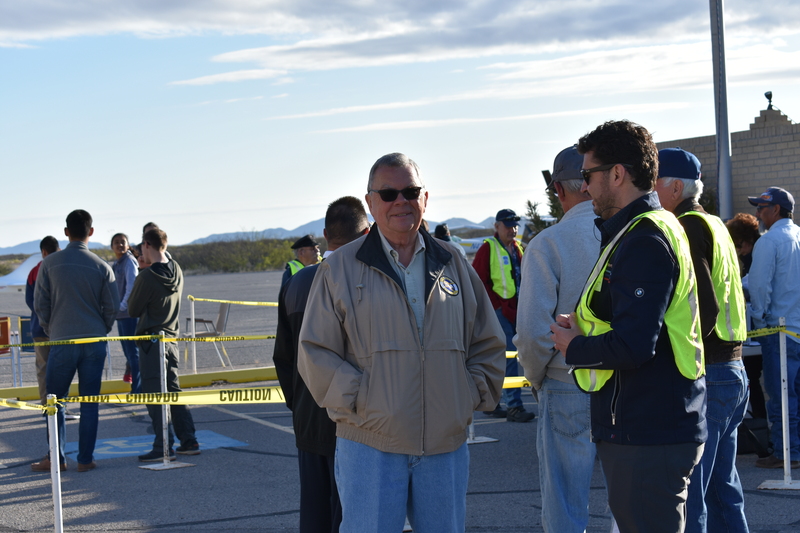 Bob Dockendorf and Tomás Peralta surveying the activities as they get undersay. 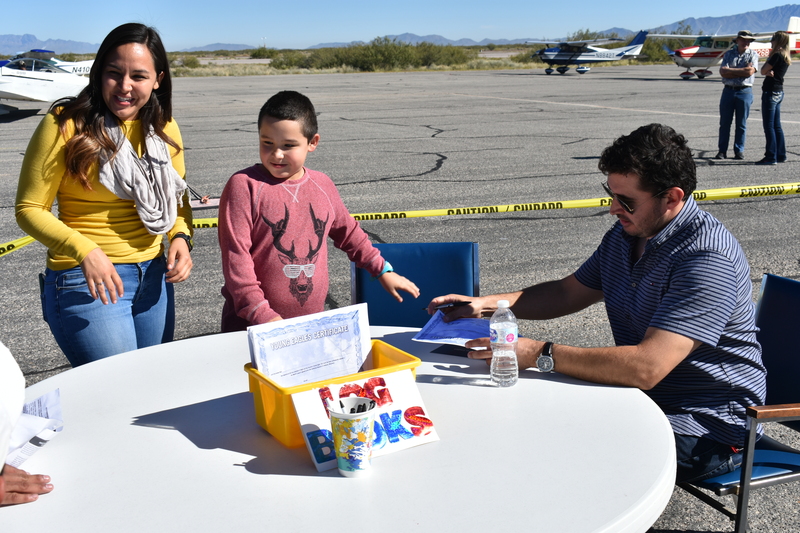 Tomás was the event’s Organizer. 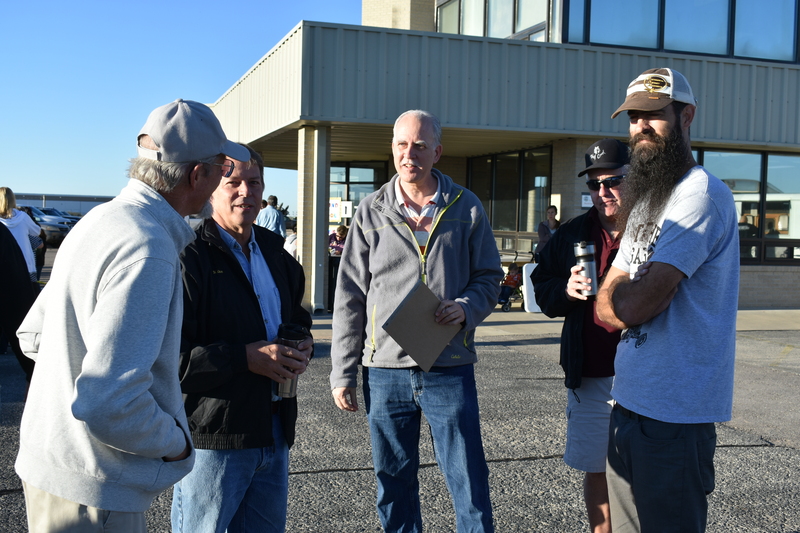 L to R: Tom Holmsley, EAA Chapter 1570 President, John Keithly, chatting with Fritz Gatlin. 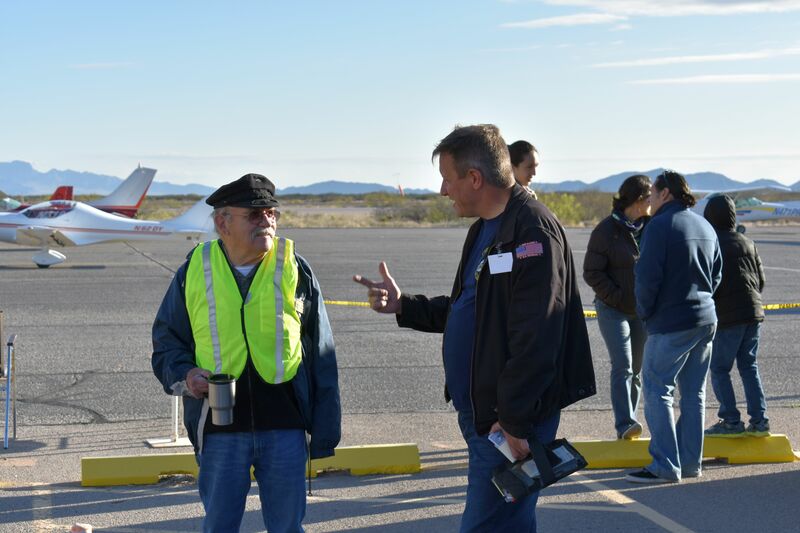 L to R: Juan Brito and Chapter VP, John Singnorino, in discussion before the flying started. 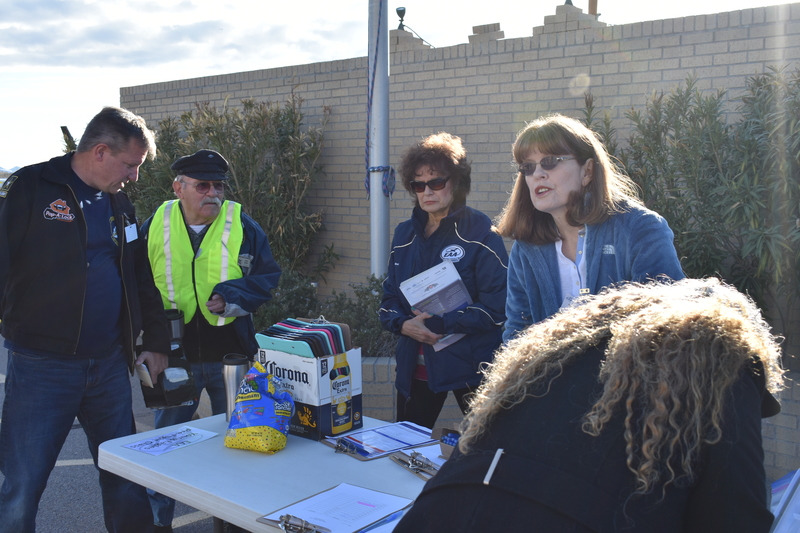 L to R: John Signorino, Juan Brito, Marcia McNamee and Melissa Keithly at registration table as a parent signs up. 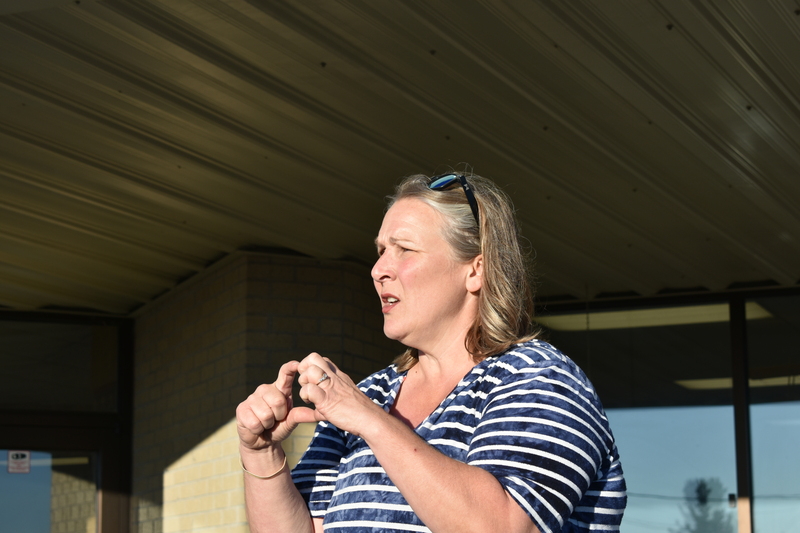 Melissa Keithly describing procedure for signing up the children . 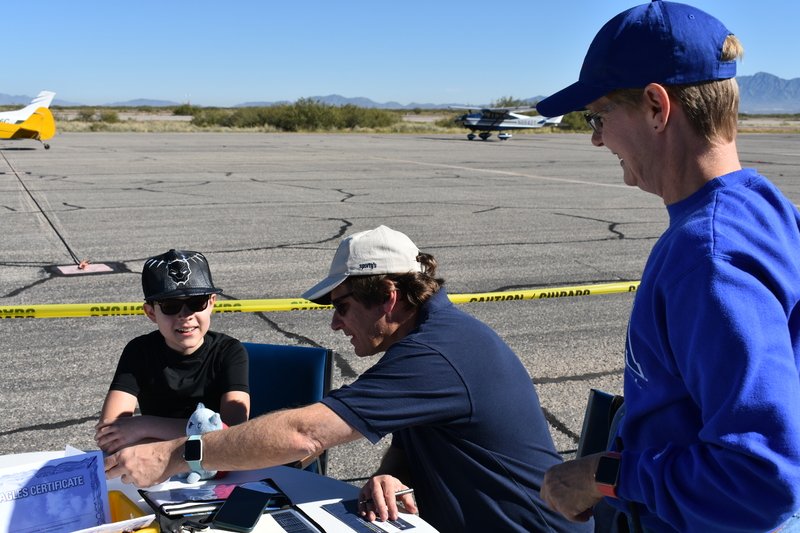 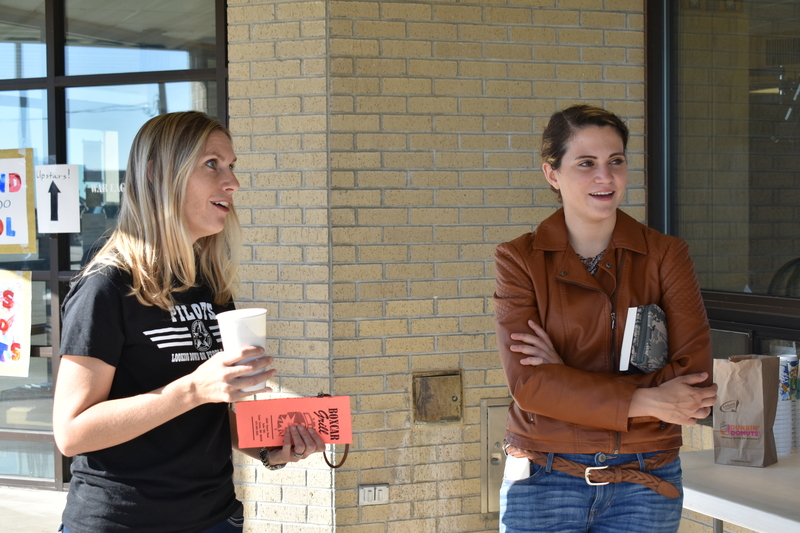 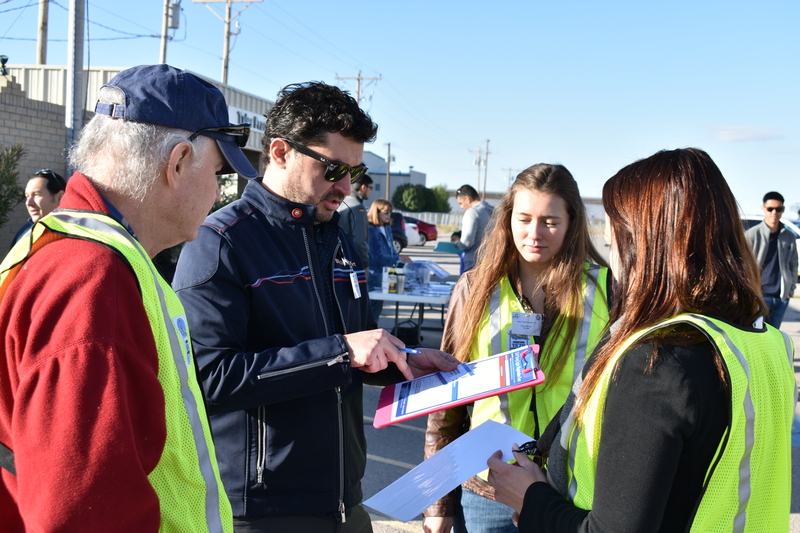 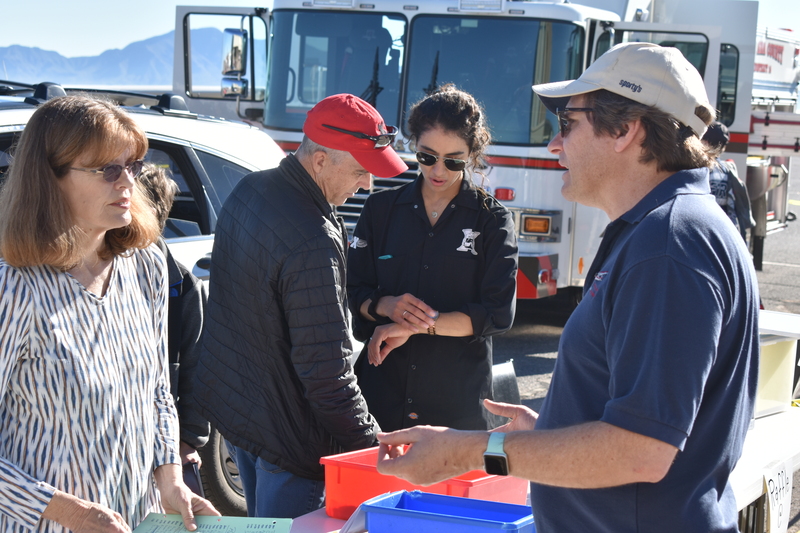 . .
L to R: Charles Crawford, Tomás Peralta, and Laura Dittlevson, going over the flight line procedures . 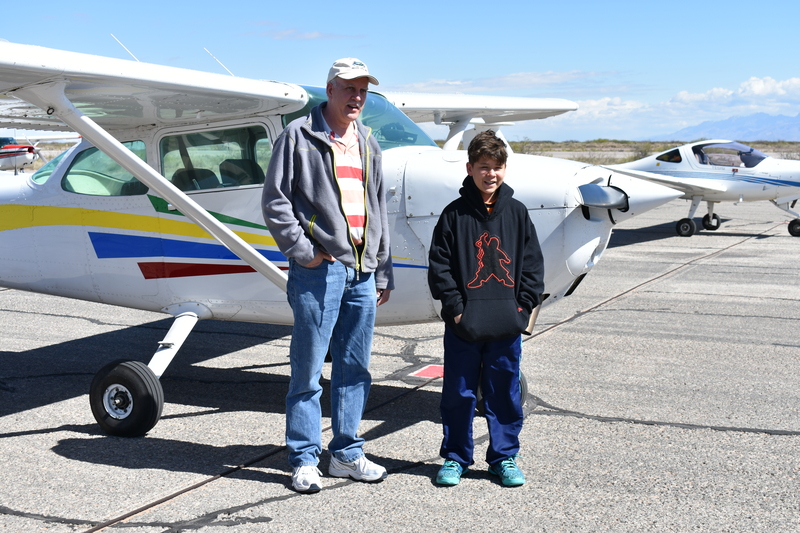 . .
L to R: John Signorino and John Orton returning from the Fllight-Line . 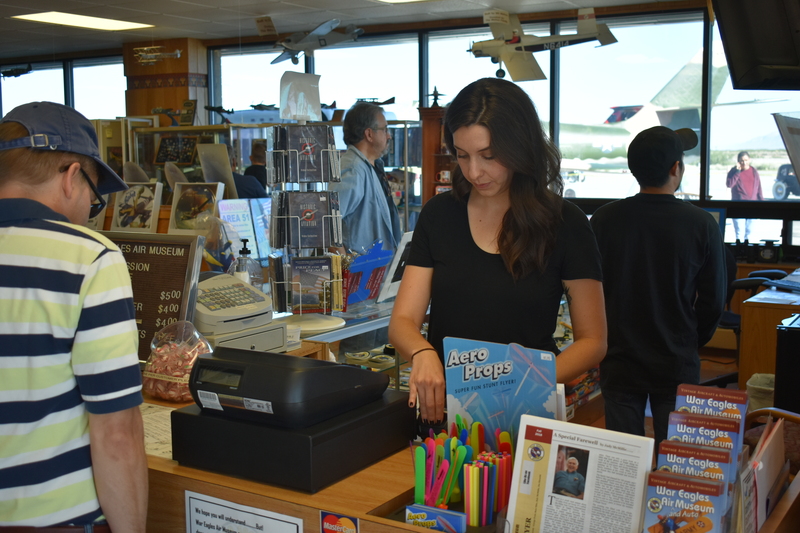 . .
L to R: Kathyn and WEAM Operations Manager, George Guerra, at work behind the WEAM Gift Shop counter. 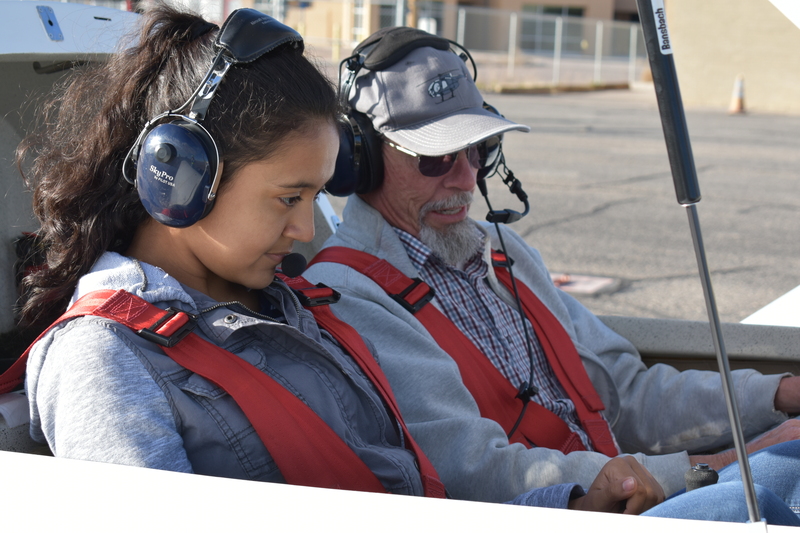 John briefs Yessenia on the aircraft controls and instruments, explainnng how they work and why they are important to fully understand. 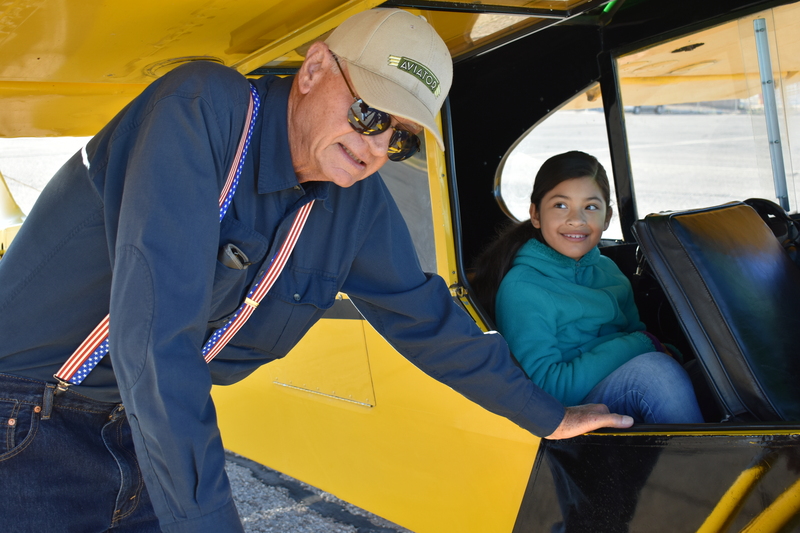 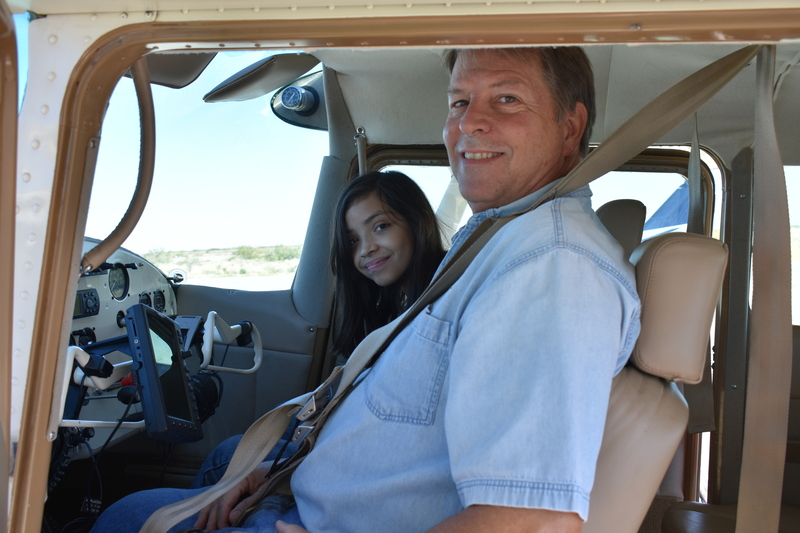 John and his next Young Eagle, Alondra Tinajero, are ready to taxi out to the runway. 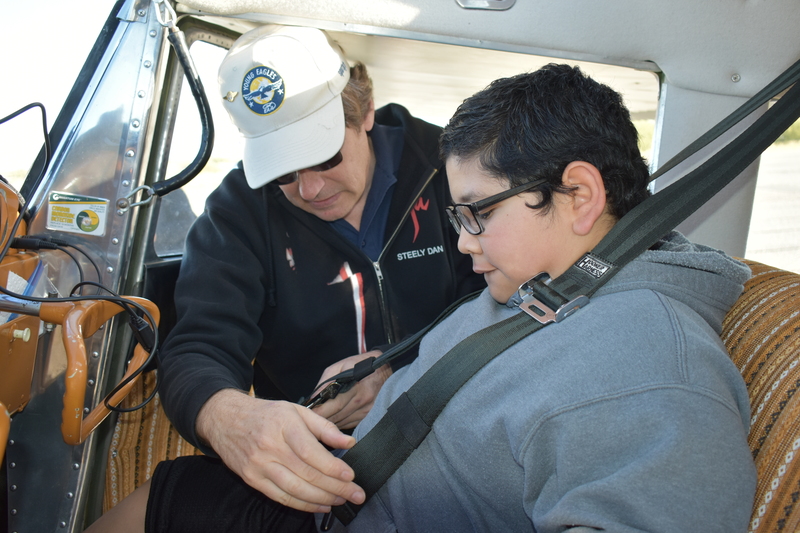 John helps Marco arrange and fasten his safety harness. 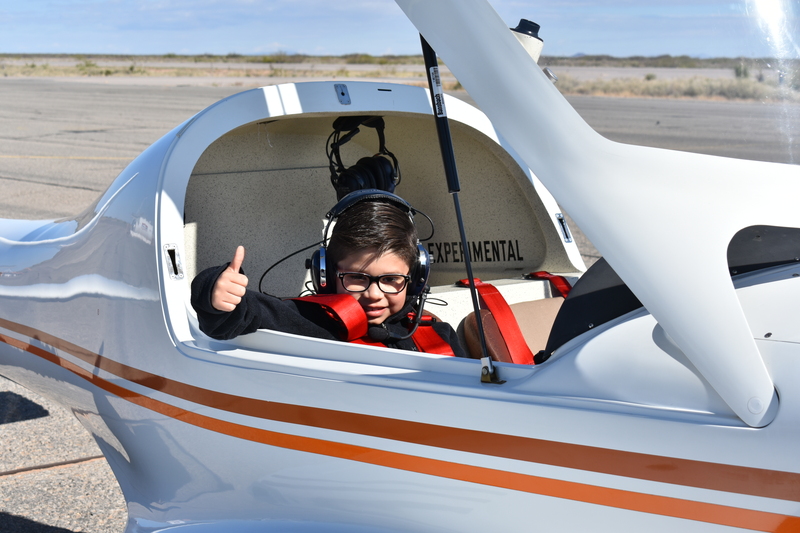 Marco gives the thumbs up signal that shows he is ready to fly! 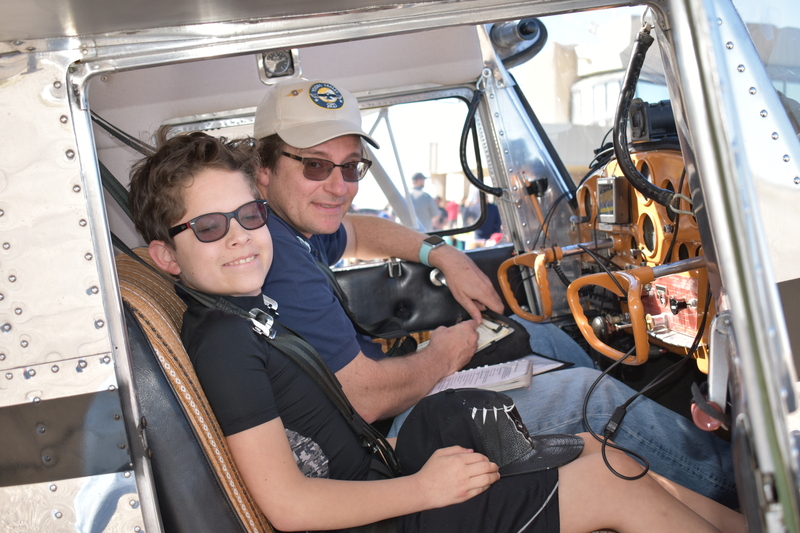 Pilot and his Co-Pilot are ready to start . 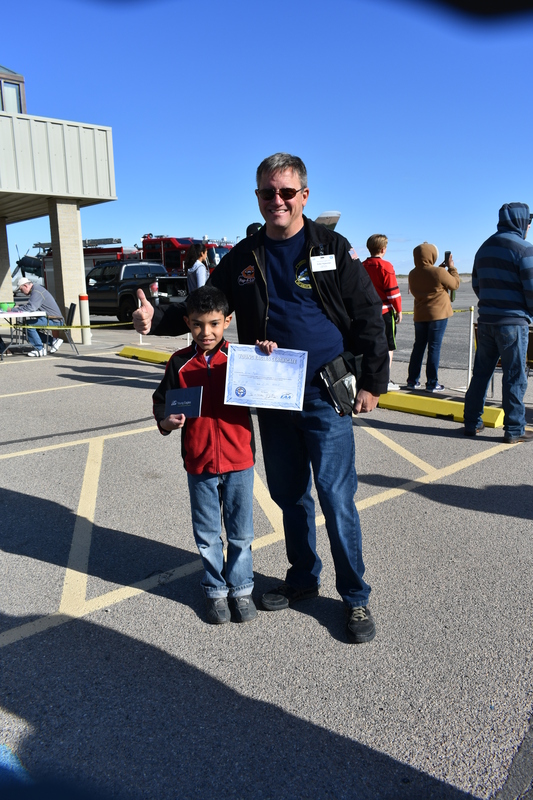 . .
Marco proudly poses with Mr. Keithly after his inaugural Young Eagle Flight. 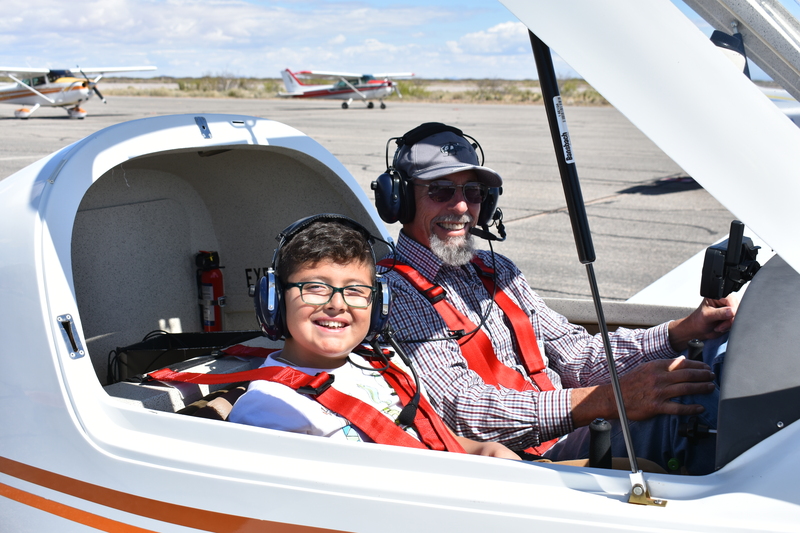 Ready to become another Young Eagle, Alfredo Vargas, is all smiles wth Pilot John Keithly. 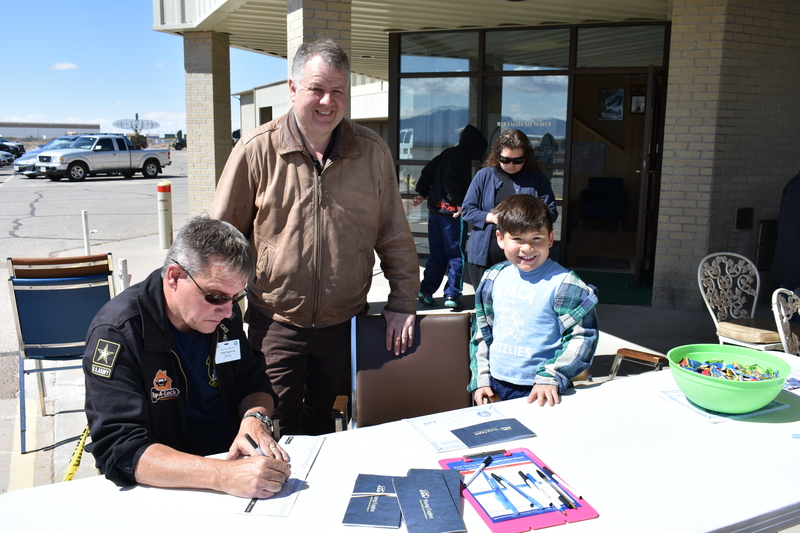 While Allan Yapor’s father stands by, John Signorino (sitting at right) completes the new Young Eagle’s Fllight Logbook entry and fills out his Official EAA Young Eagles Certificate of Accomplishment, attesting to Allan’s 1st Flight Adventure. 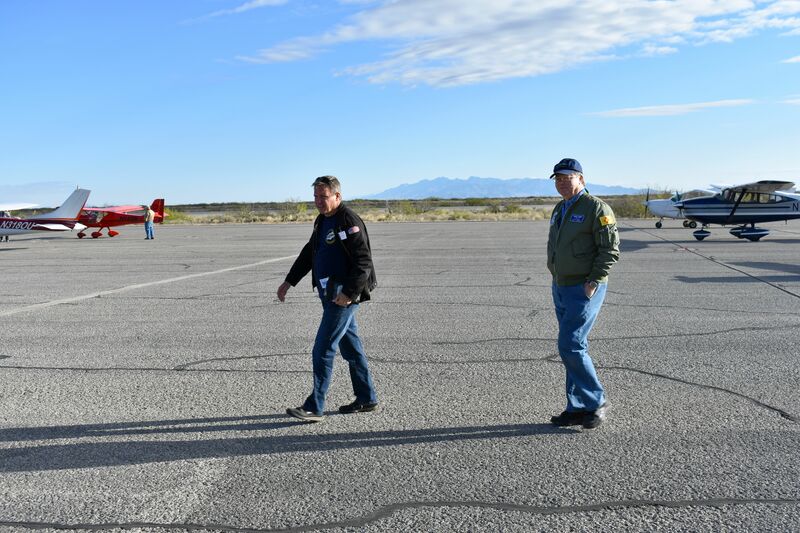 Allan Yapor stands proudly next to his pilot, John Signorino, who is a former Army Combat Aviator and Vice President of the 1570 Chapter. 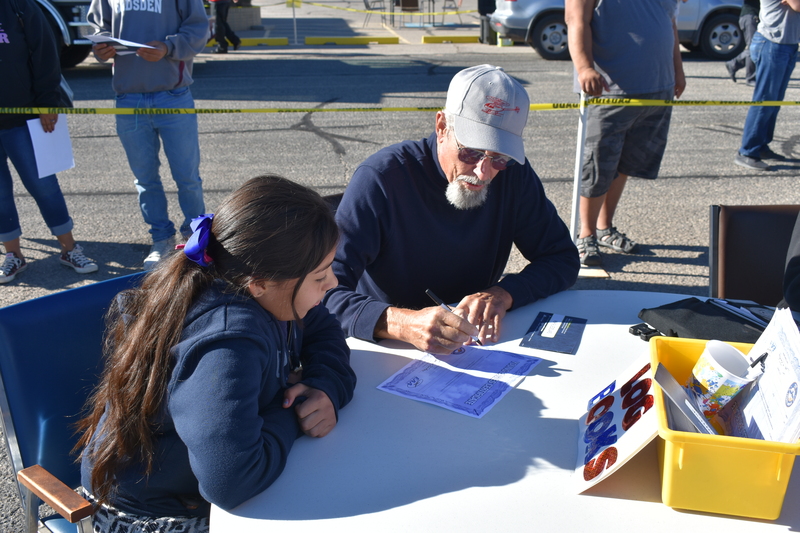 John owns and manages the security locksmithing firm, Pop-A-Lock, in El Paso, Texas. 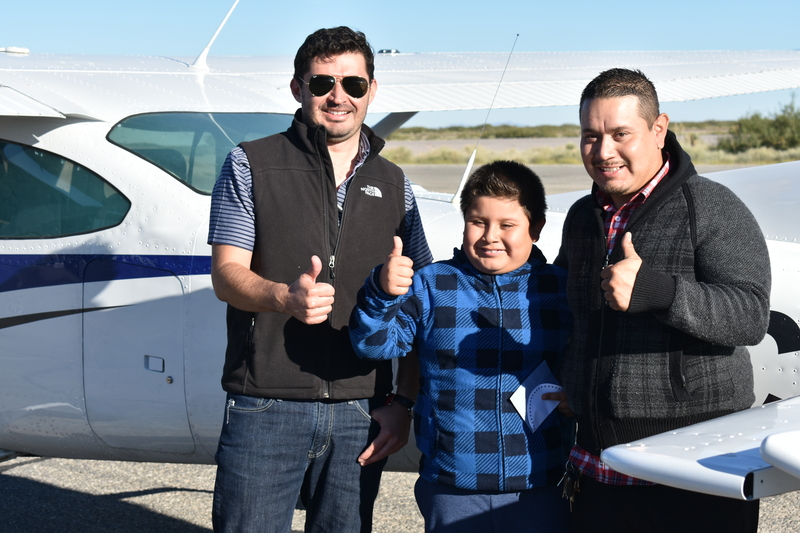 John Signorino taxis back from his flight with his new Young Eagle, Vincent Hardy, whose lucky father, Philip, went along in one of the Cessna 182 Skylane’s back seats. 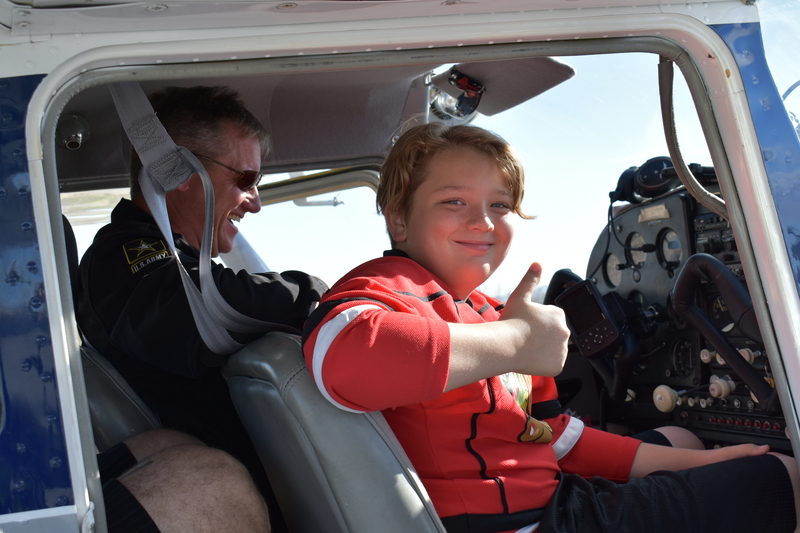 New Young Eagle, Vincent Hardy, is alll smiles after his first Flight Adventure as John Signorino’s Co-Pilot. 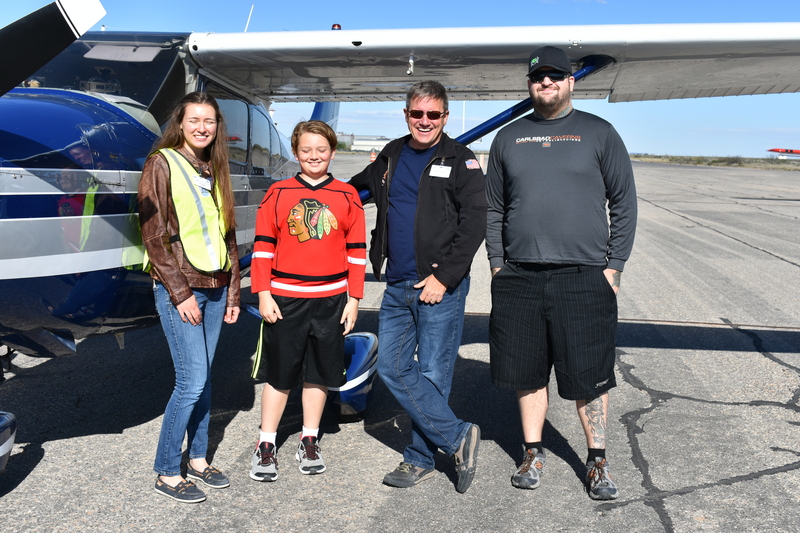 L to R: Ground Crew volunteer, Laura Dittevson, Vicent Hardy, John Signorino, and Philip Hardy pose beside the Cessna Skylane. 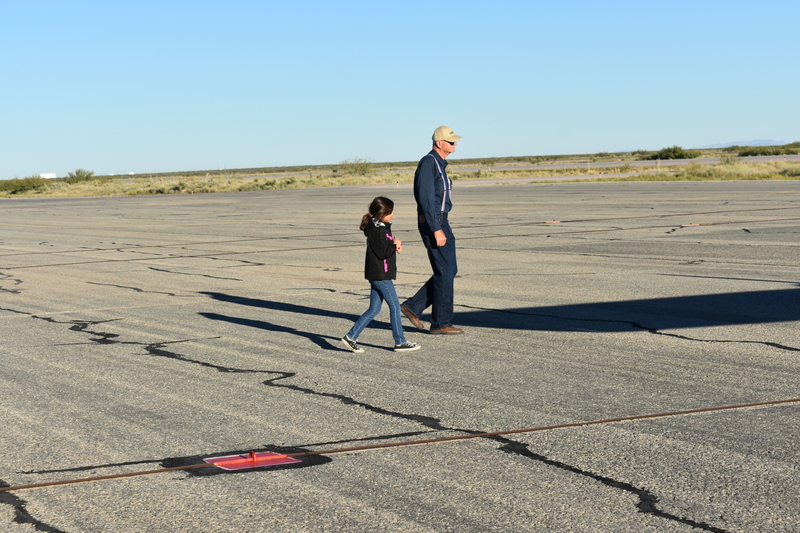 Back down to Mother Earth for the Pritchetts. 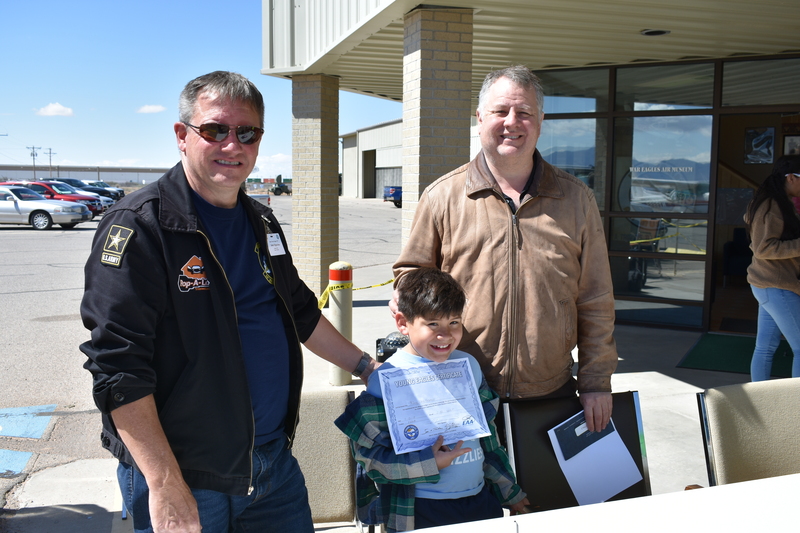 L to R: John Signorino, the proud new Young Eagle, Nicholas Pritchett, and his father, Virgil, pose with the newly made out EAA Achievement Certificate and Young Eagle Log Book. 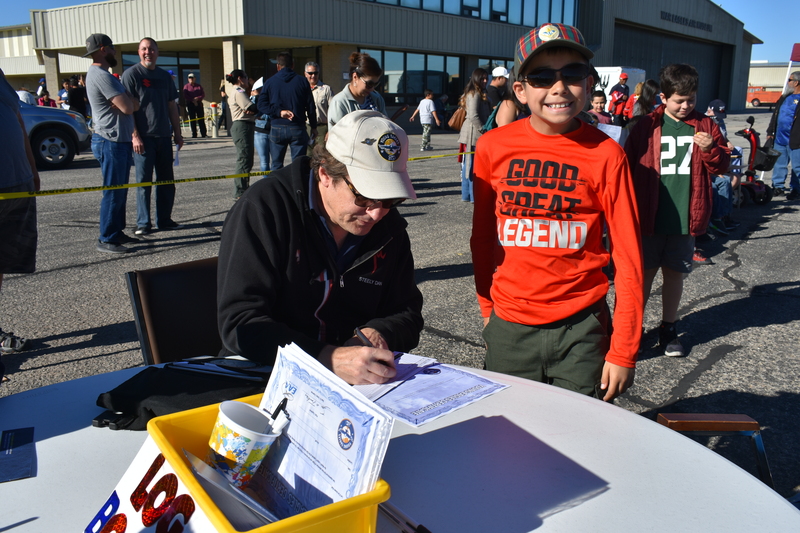 L to R: John Completes new Young Eagle, Riley Franco’s Logbook, as his father, Ruben smiles with satifaction. 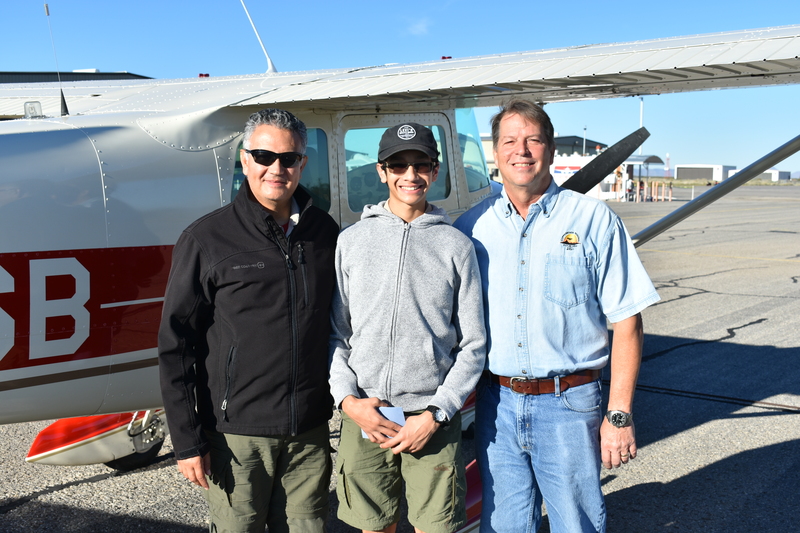 Certificate in hand, Riley and his Dad, Ruben Franco, are all smiles, as is their Pilot, John Signorino. 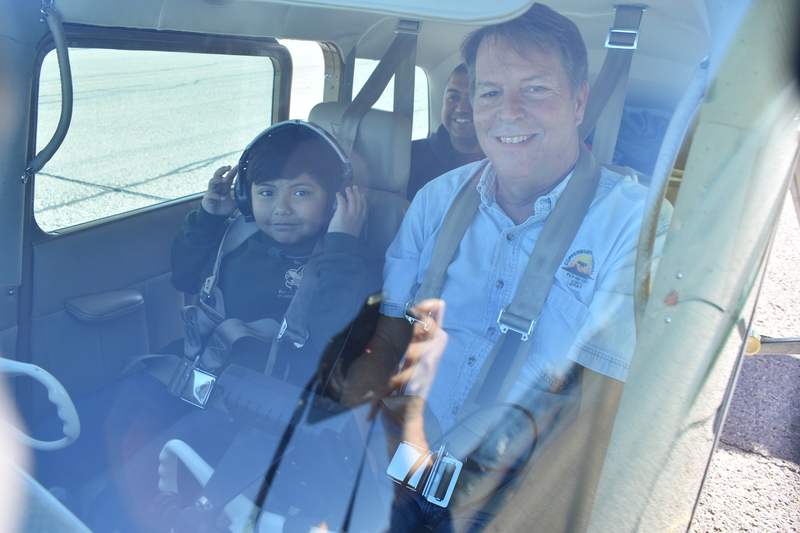 L to R in cockpit of former Army Helicopter: Mike McNamee and his Young Eagle adventurer, Oliver Oropeza. 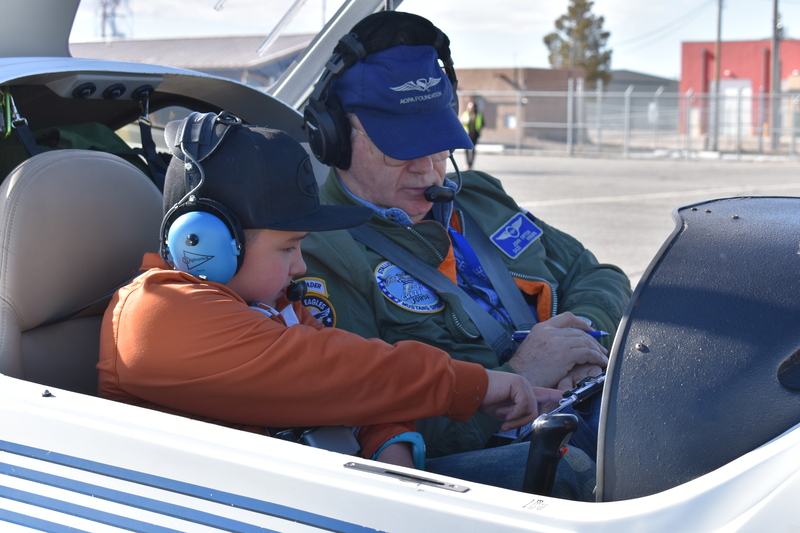 Mike is explaining the controls and instruments to his awestruck Young Eagle. 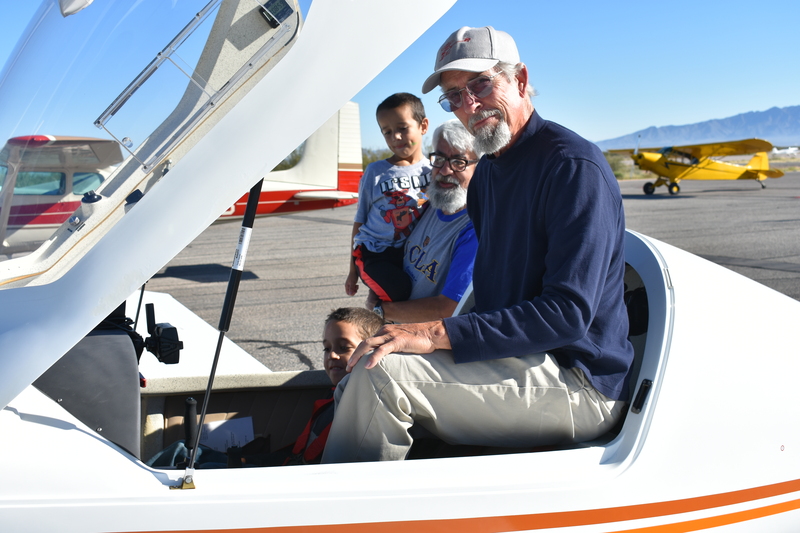 Mike also has a fixed wing Cessna 182 Skylane, which he generously contrtibuted to the event’s group of working aircraft. 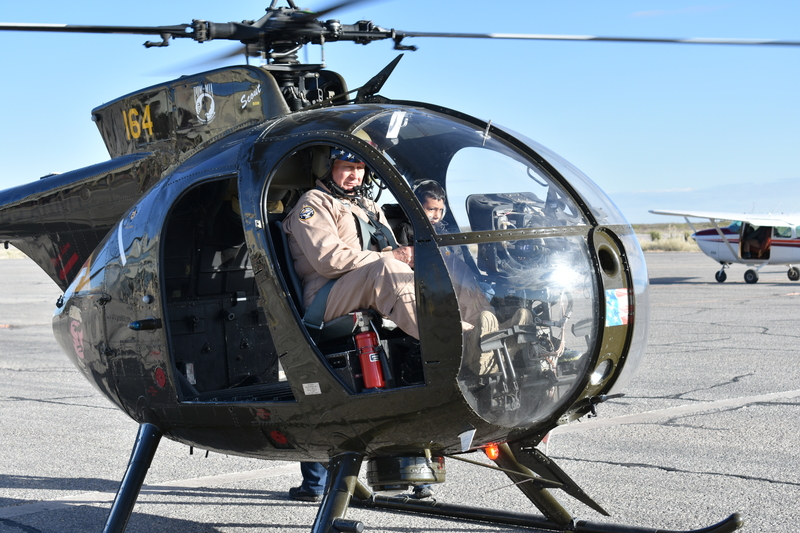 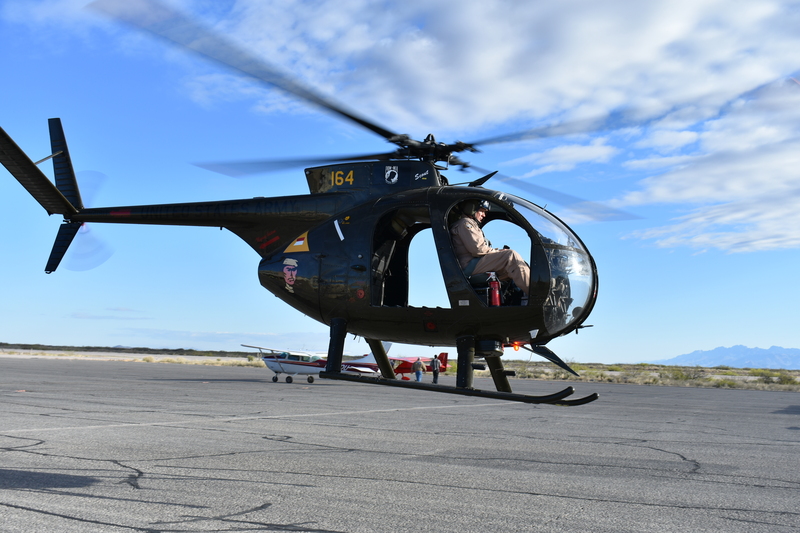 Mike sets the rotors in motion as he warms up his chopper for takeoff. 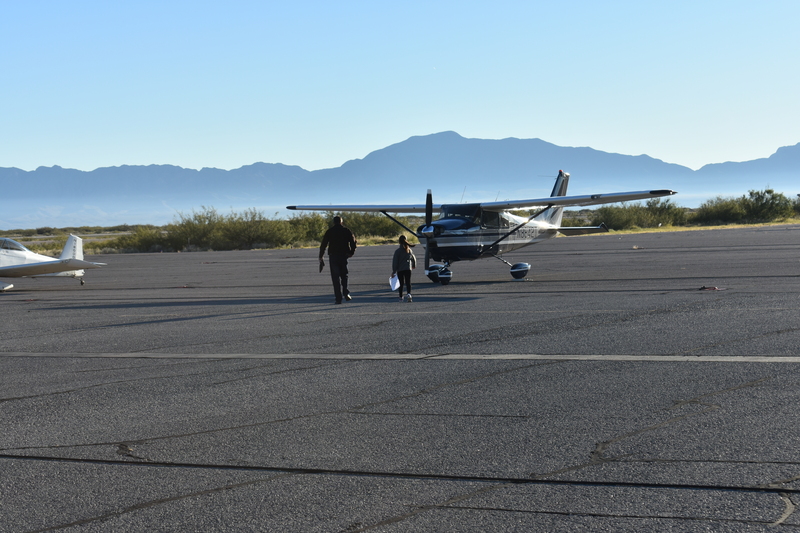 And, straight up, off they go! 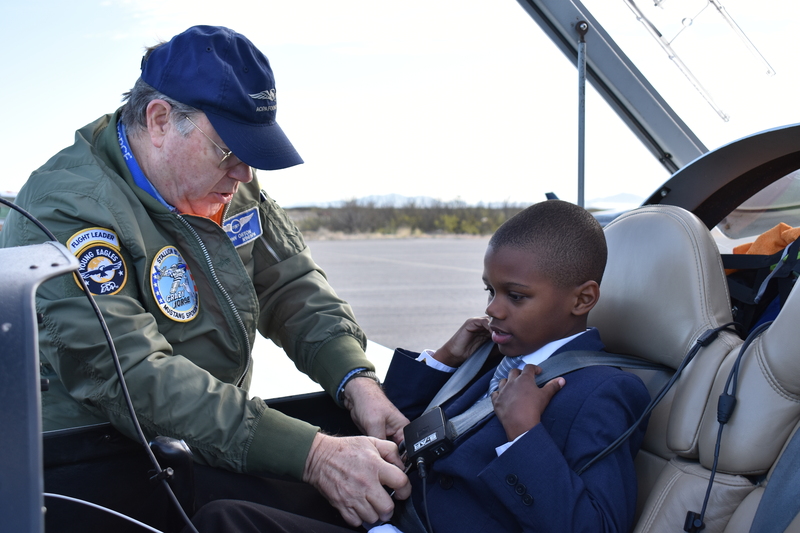 Pilot, John Orton (long-time Advisor and former Trustee of the FASF) helps his Young Eagle, Justin Walters, safely and comfortably secure his seat belt and shoulder harness. 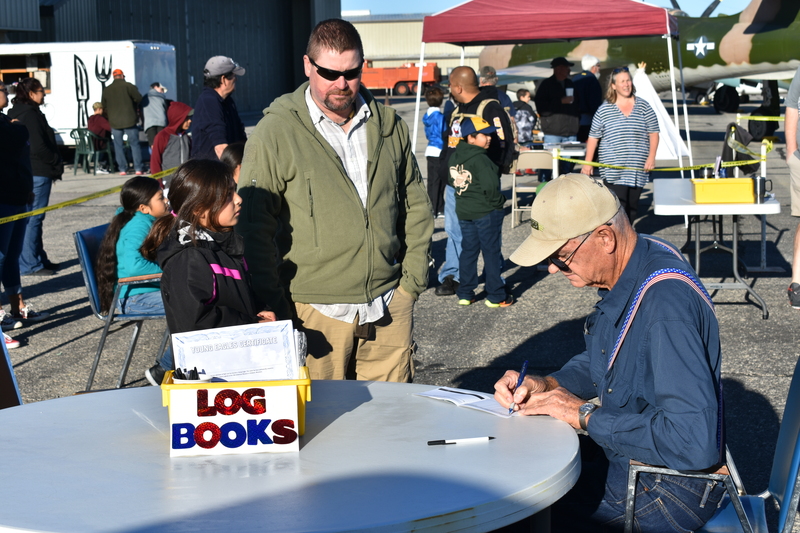 John is both a former army and Air Foce veteran. 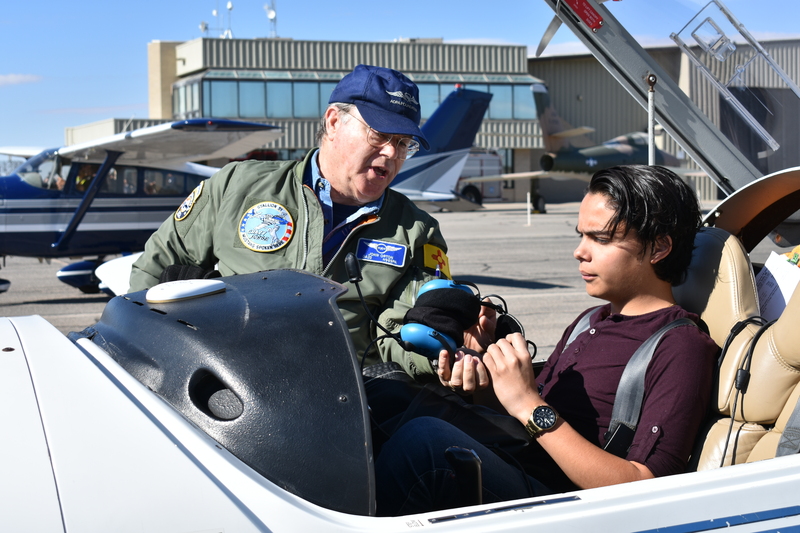 His airplane is a U.S. manufactured Diamond DV20, used by the USAF to provide pilot-training for Air Force Academy Cadets. 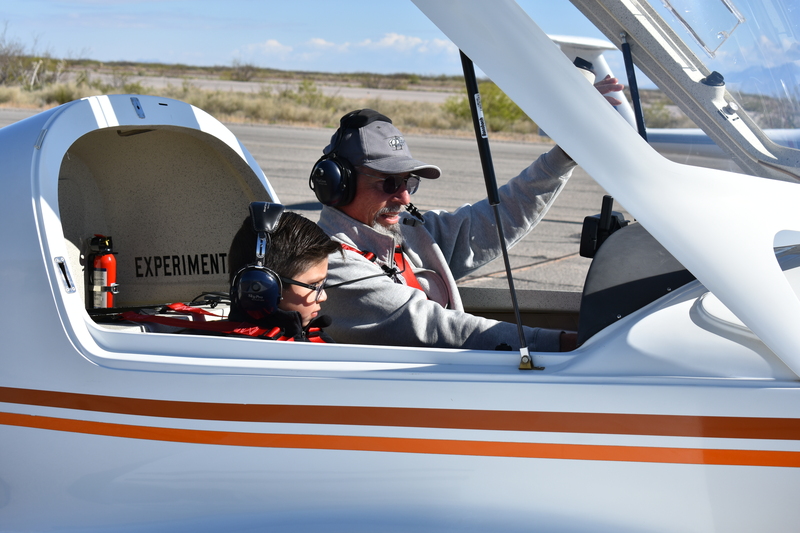 Final adjustments to the now fastened safety harness, and they were soon aloft. 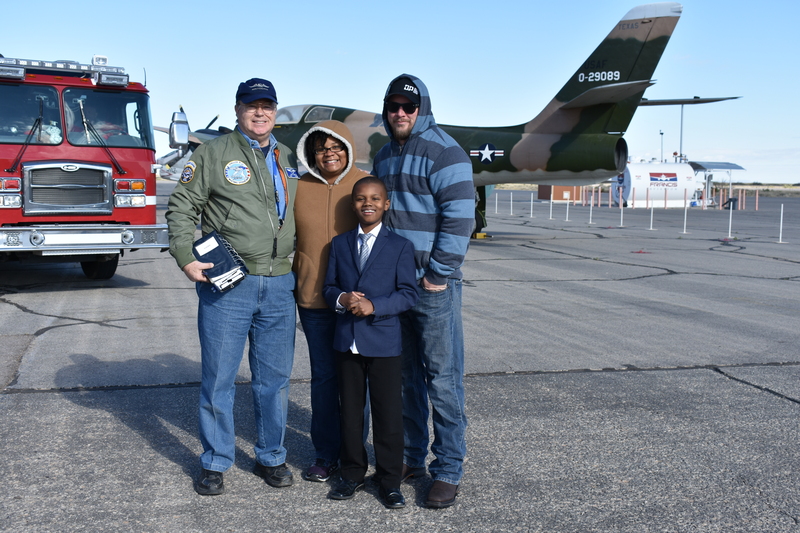 The new Young Eagle, Justin Walters, poses with his happy Mother, Danielle, and Father, Mike Fisher. 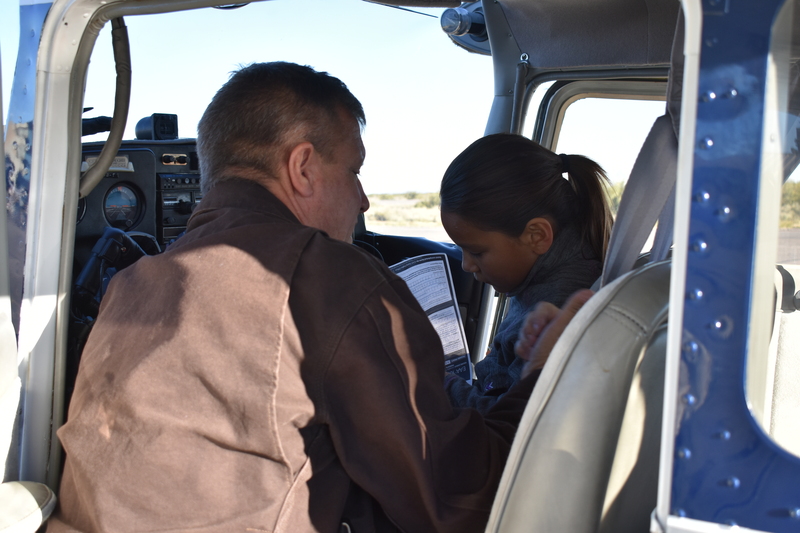 John Orton explains, to his next Young Eagle, Kristopher Zapata, how to use the Headset and mic. 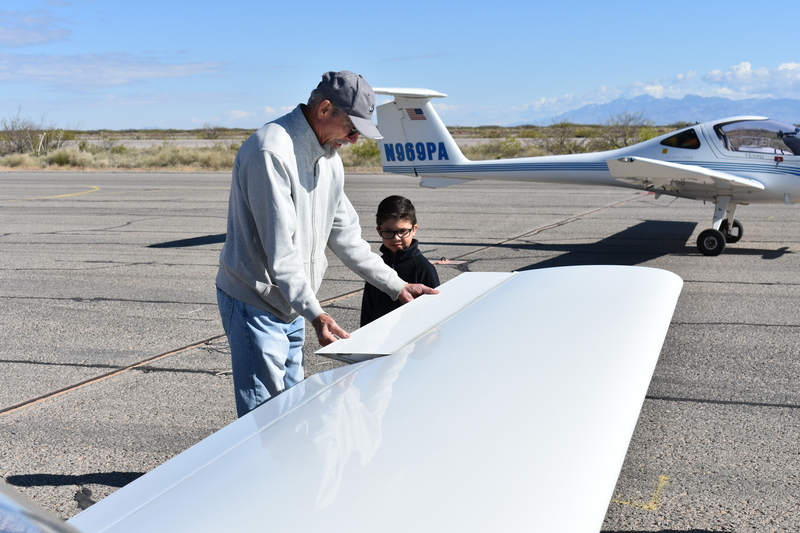 John explaining the instrments and controls to Kristopher. 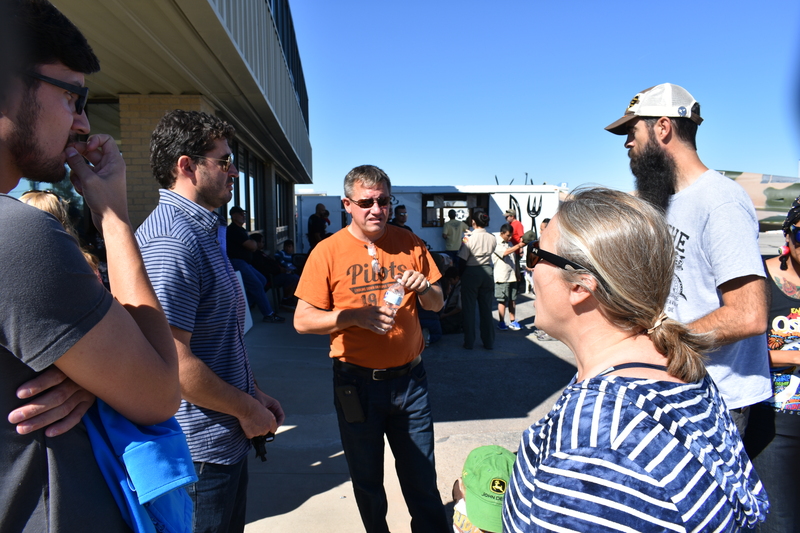 L To R: Chapter Ground Crew Volunteer, Charles Crawford and Mrs. Zapata, watch as her son, Kristopher gets briefed by John Orton . 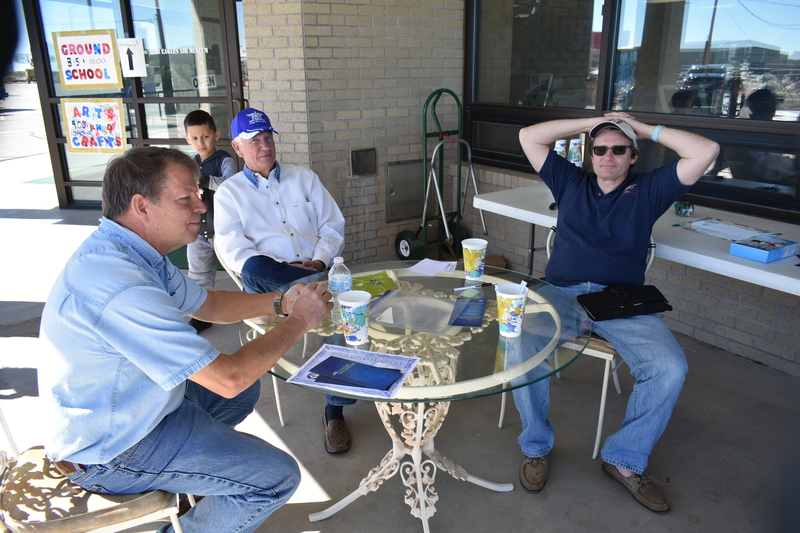 . .
Kristopher watches as John Orton goes through the startup checklist . 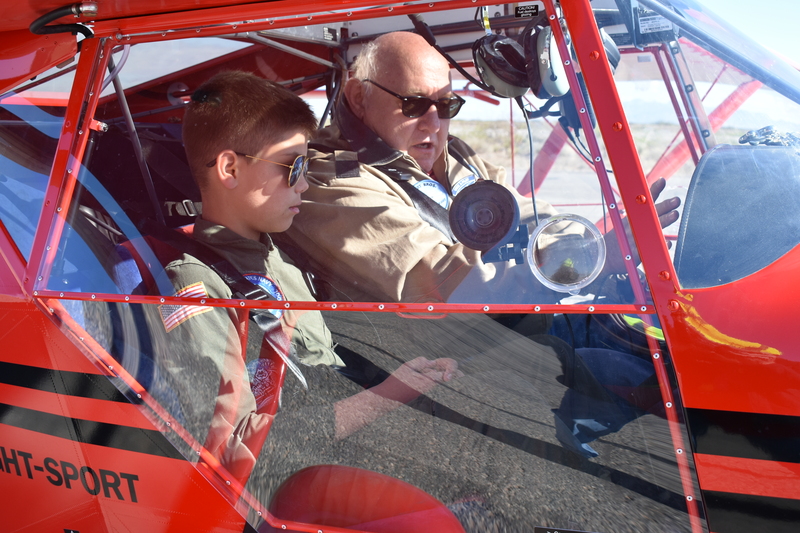 . .
John watches as his next Young Eagle, Daniel Rayos, gets into the cockpit. 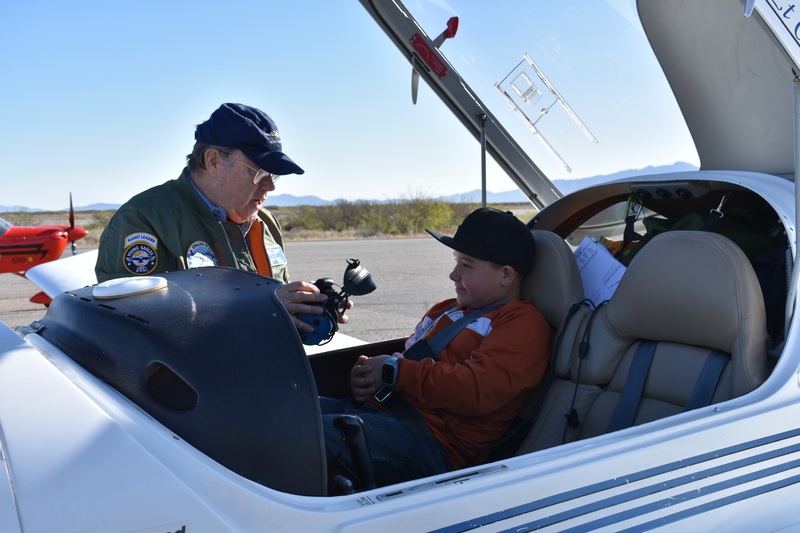 John explains to Daniel the use of the headset and microphone. 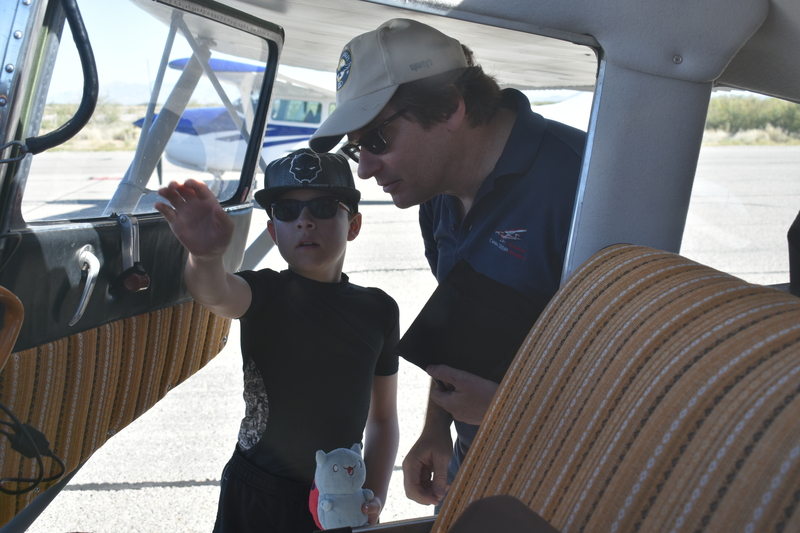 Daniel waves adios as John begins to taxi outfor takeoff. 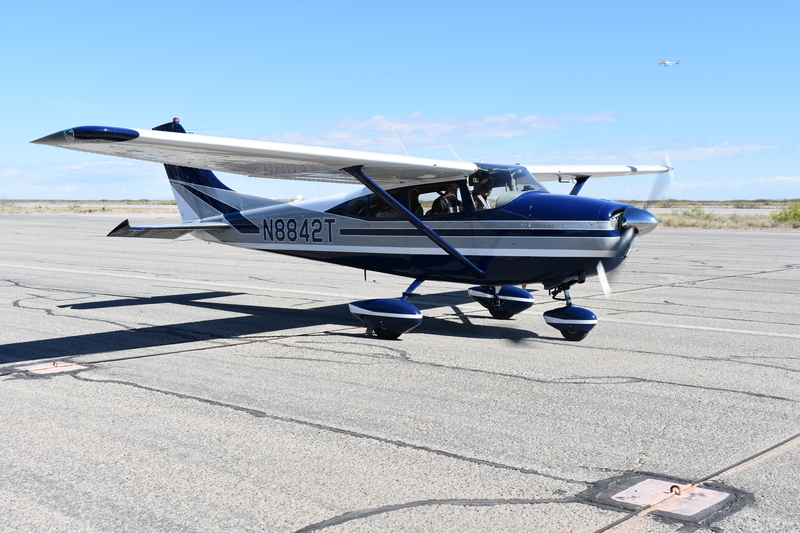 The following short (3 min) video shows the start and departure for their takeoff. 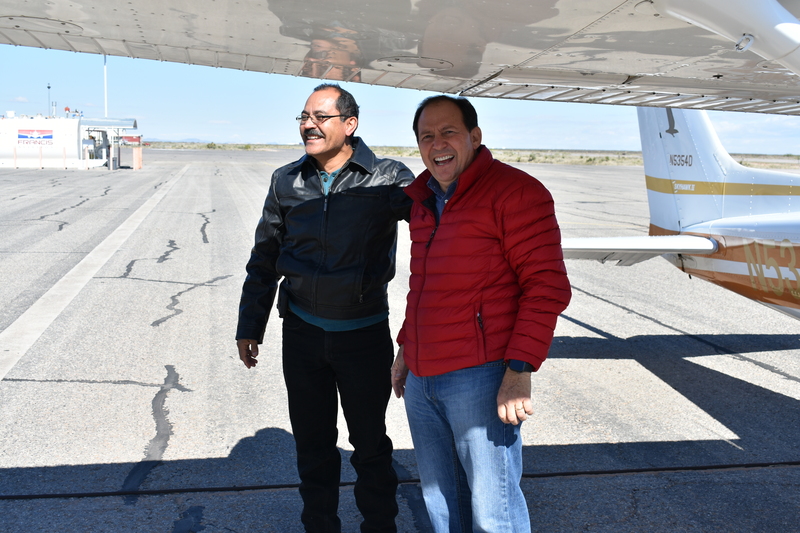 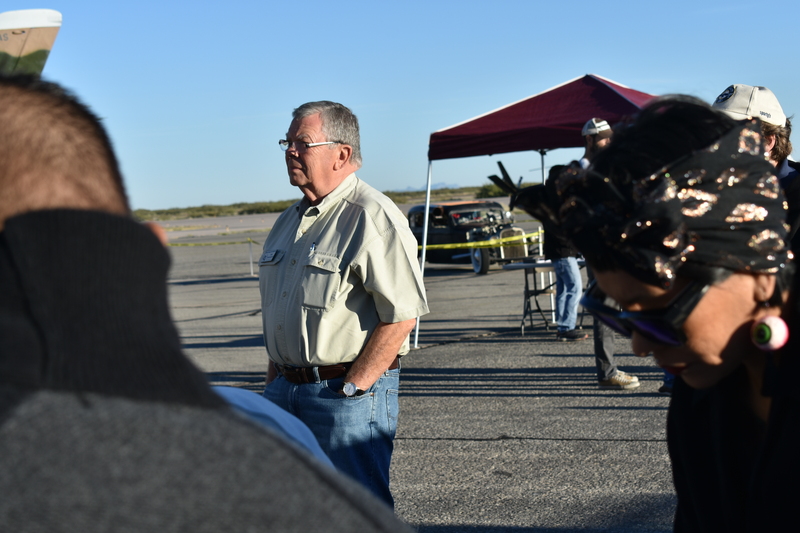 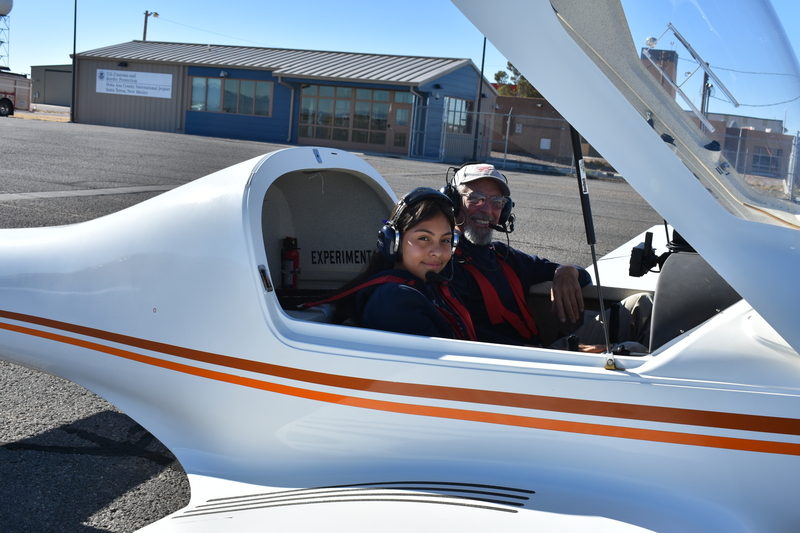 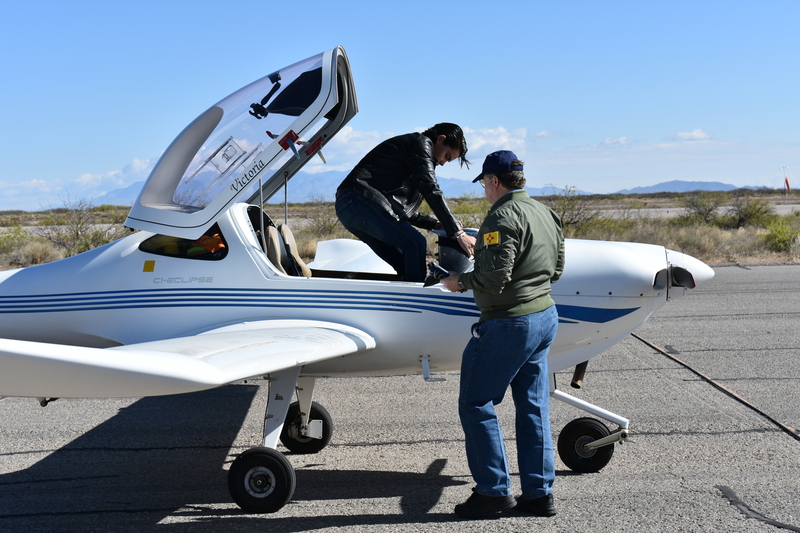 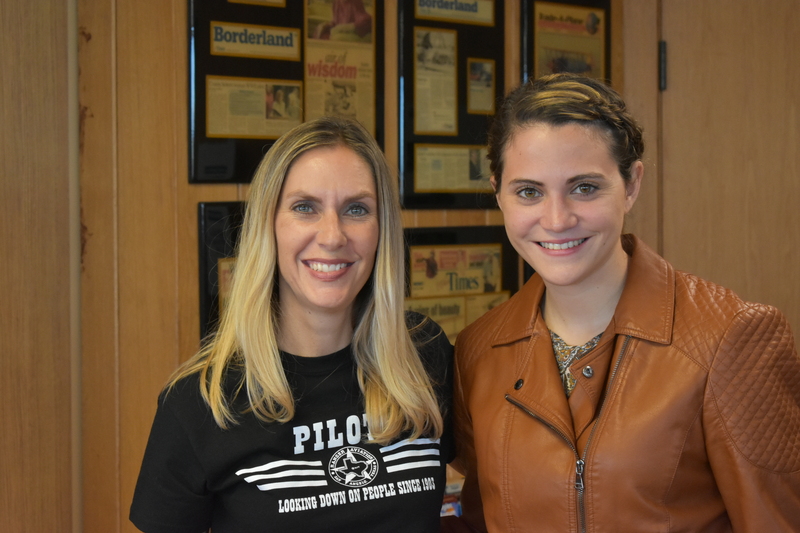 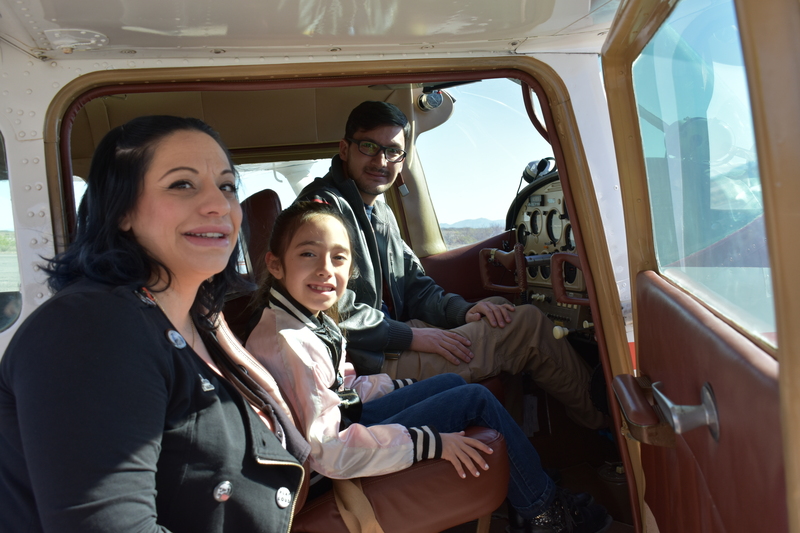 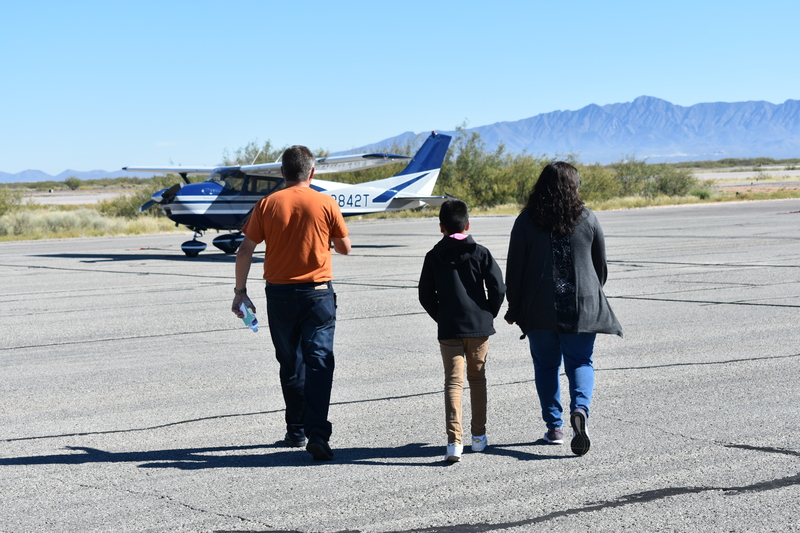 El Paso Judge, Alex Gonzalez, just took Larissa Rodriguez (left, standing) up on her Young Eagle Flight in his Cessna 172. 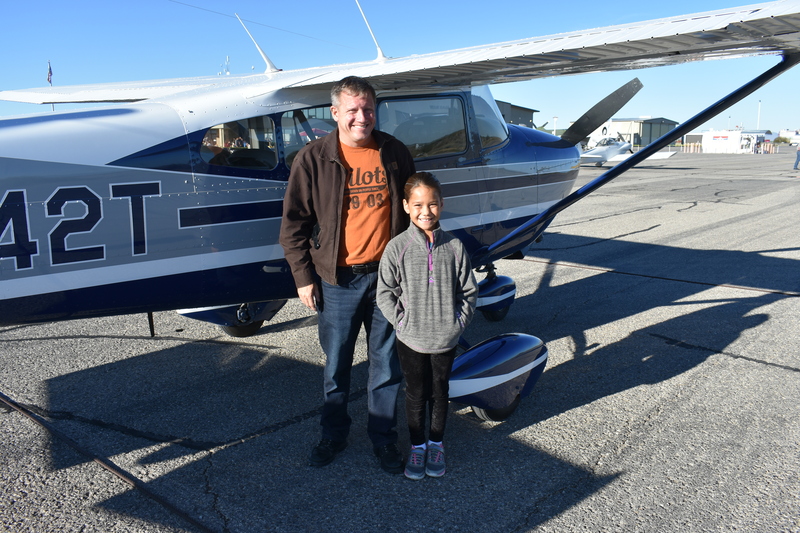 Her parents sat in the rear seat. 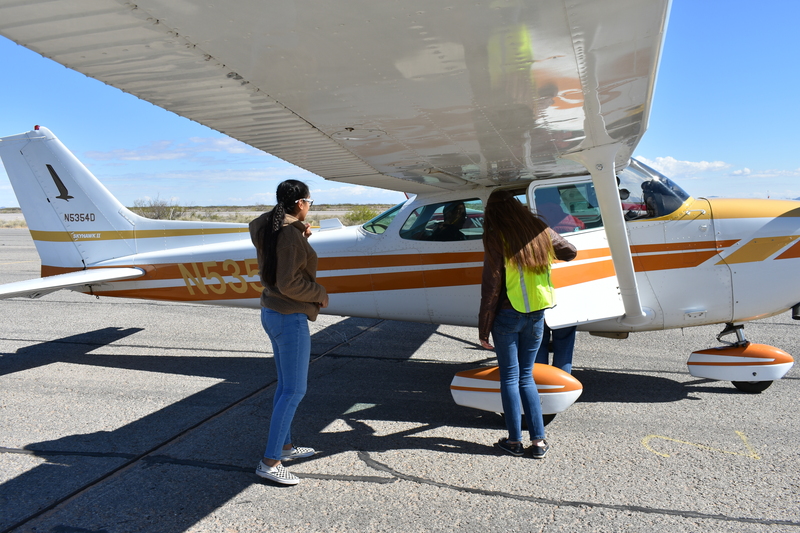 Ground Crew Volunteer, Laura Dittevson, helps by holding open the passenger door. 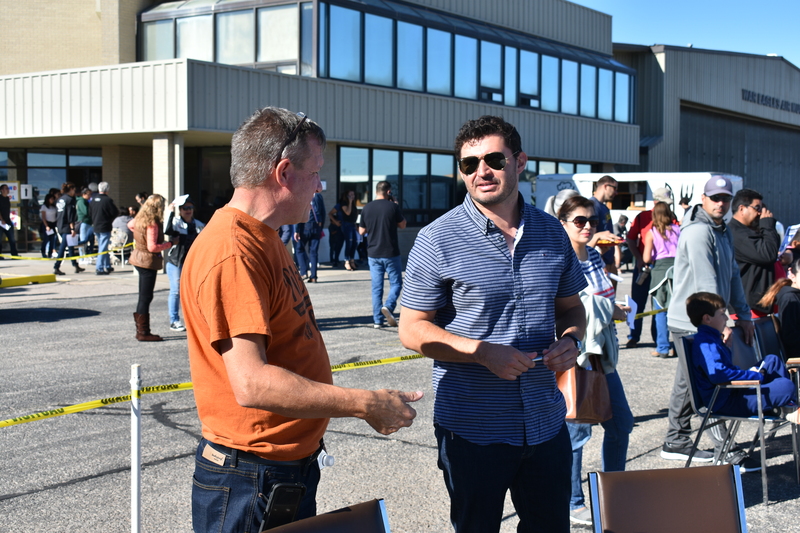 L to R: Clearly, Larissa’s father, Andres, enjoyed the experience as much as did Judge Gonzalez. 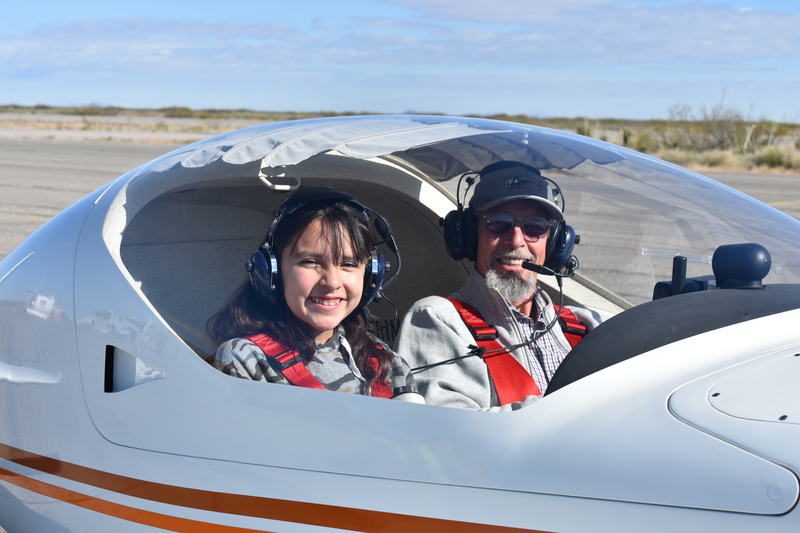 The following short (51 seconds) video is of their return to pick up Larissa’s Young Eagle Certificate and Logbook. 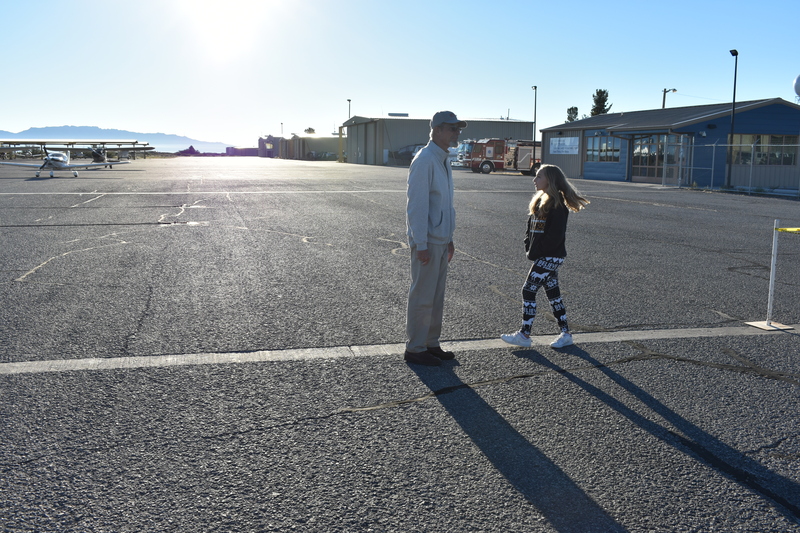 The second, one (1) minute video, is their discusion of the flight experience. 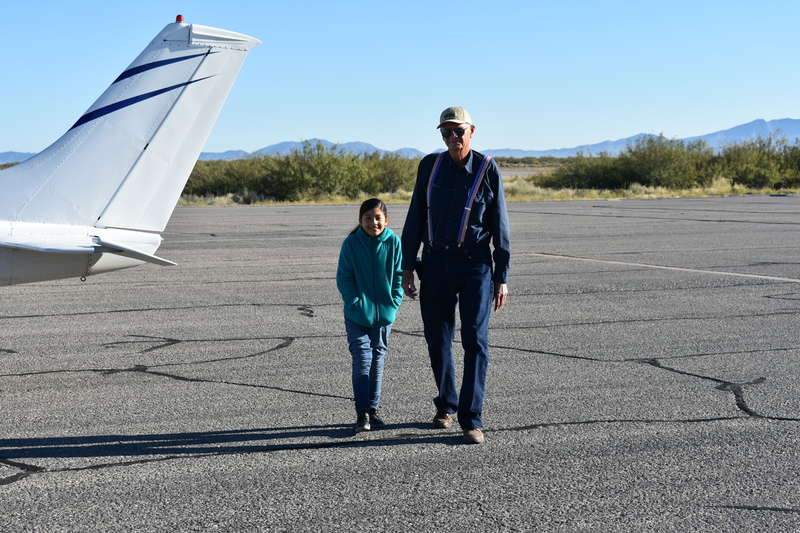 Jim Foster and his Young Eagle are at the end of this video, too. 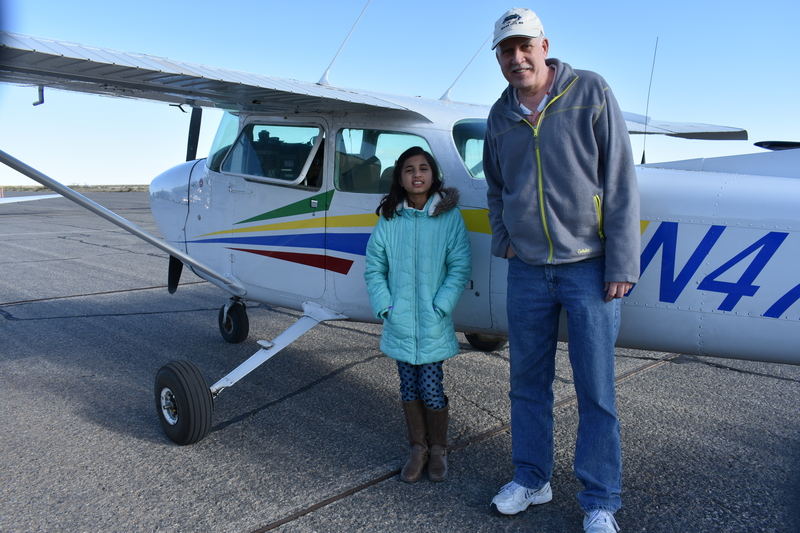 Professional Instructor Pilot, Jim Foster, poses by the Cessna 172 in which he just initiated Young EAgle, Amna Noor, to the thrill of flying. 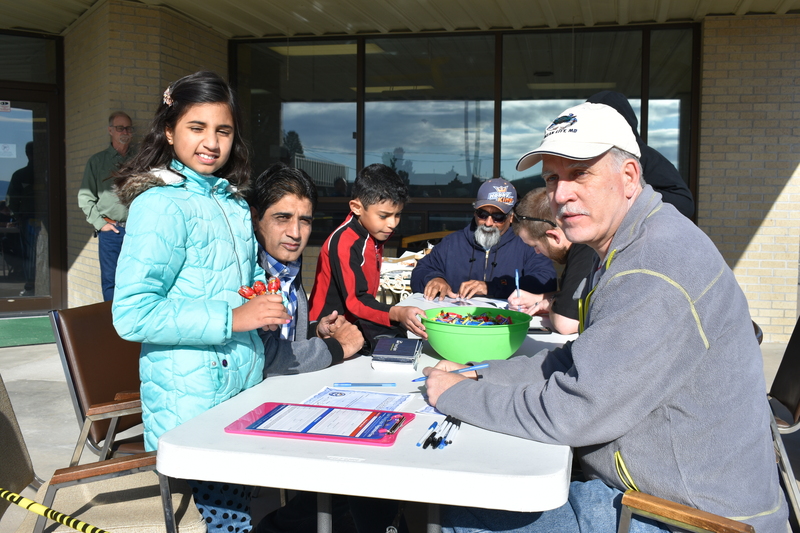 Amna and her father look on as Jim finishes up the paper work. 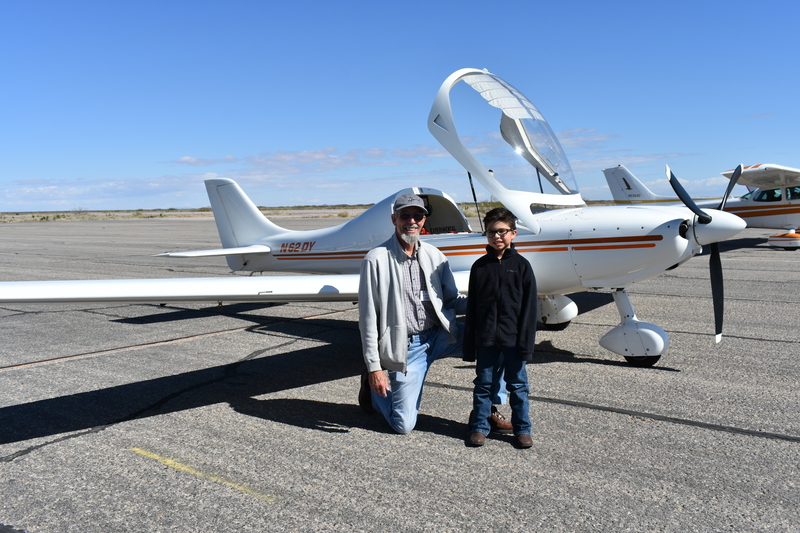 Jim Foster poses with his Young Eagle Co-Pilot, “RJ” (Ruben) Franco, whose brother, Riley, also obtained his Young Eagle award, earlier, from John Signorino. 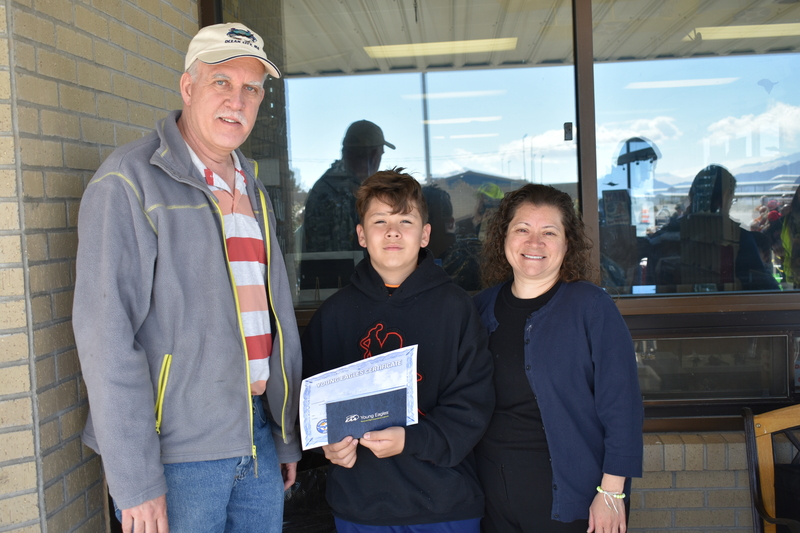 EAA Young Eagle Certificate and Logbook in hand, “RJ” poses with his mentor, Jim Foster, and his Mom, Lisa. 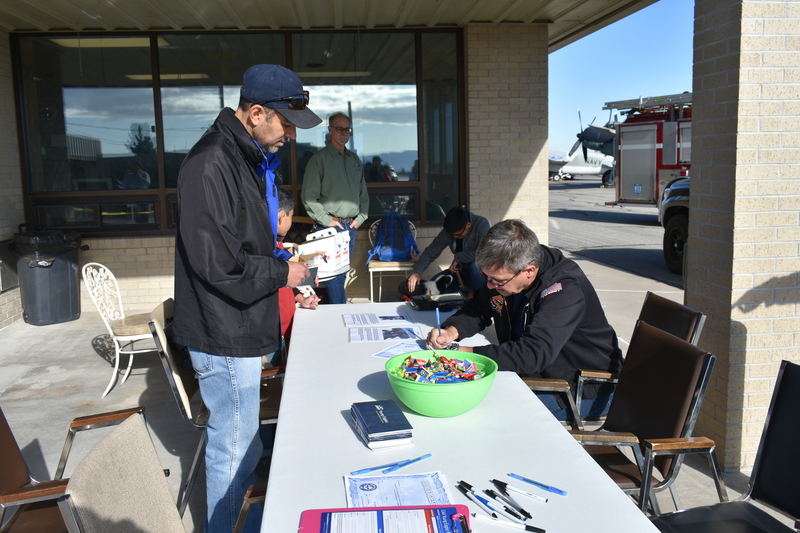 German Air Force (Lufwaffe) specialist, Dominic Austen, from chapter 1570, chipped in and did his part, too. 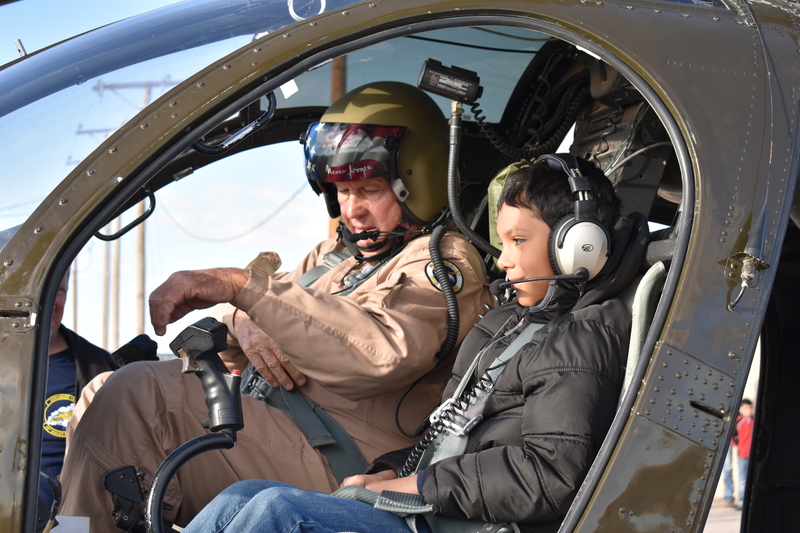 His first Young Eagle of the day is seen above: Zion Hernandez. 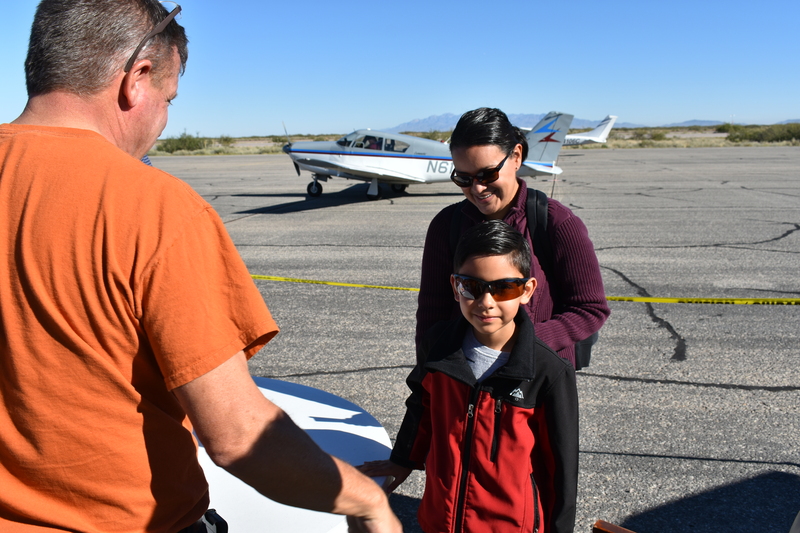 Jada Gaton is now a Young Eagle, and her mother, Arecely poses by her, as Pilot, Dominic Austen, approvingly looks on. 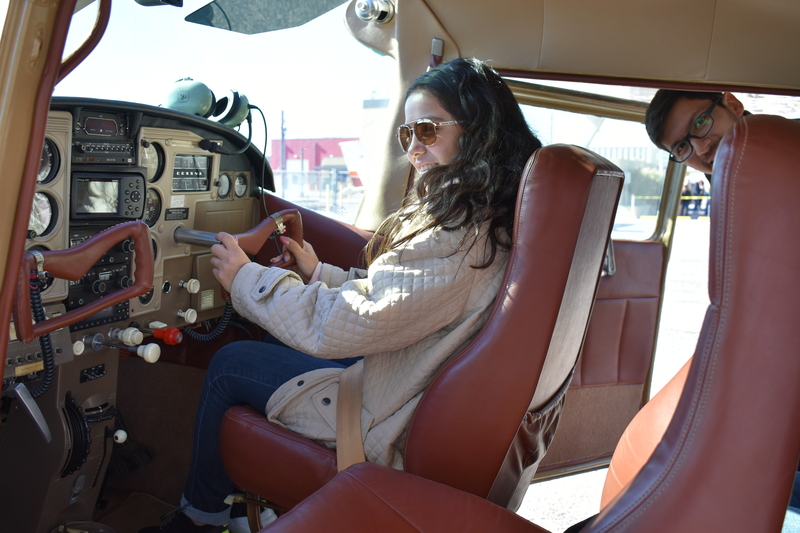 Andrea Rayos eagerly moves the control yoke in the Cessna 182 Skylane in which she achieved her Young Eagle status, as did her brother, Daniel, who flew with John Orton earlier. 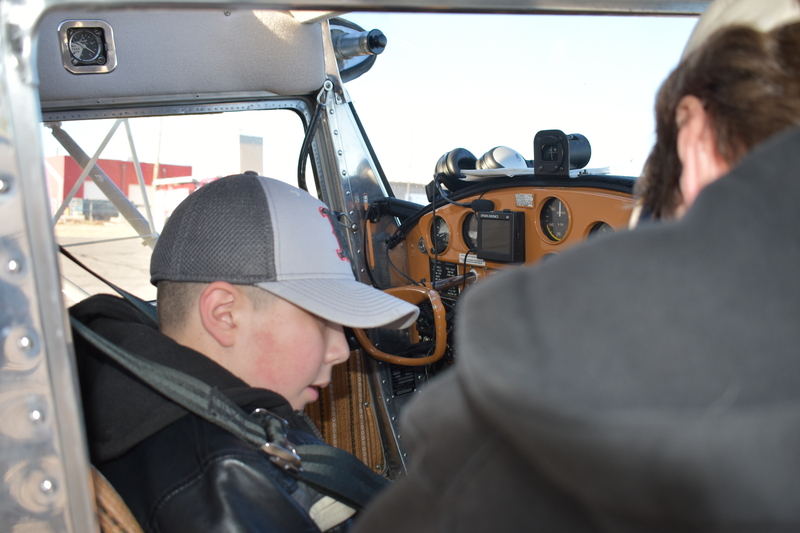 Dominic watches from the door. 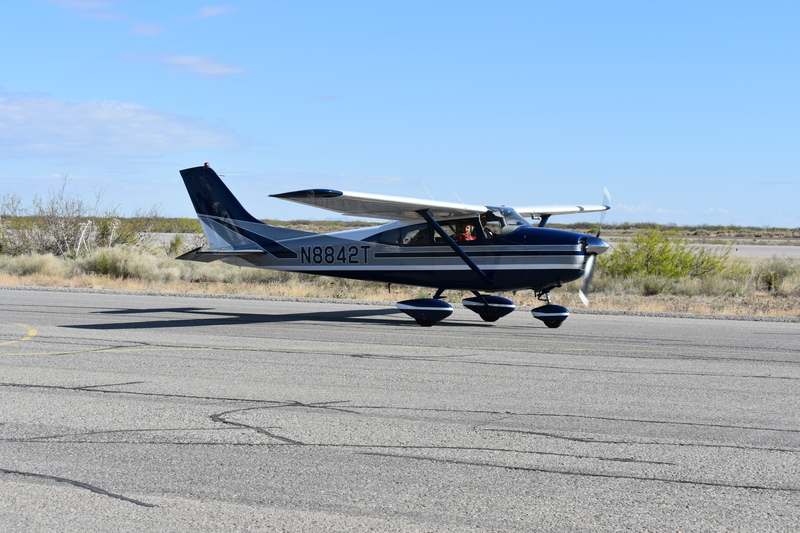 The short (11 second) video below shows Dominic and Andrea as they start the engine to taxi to the runway. 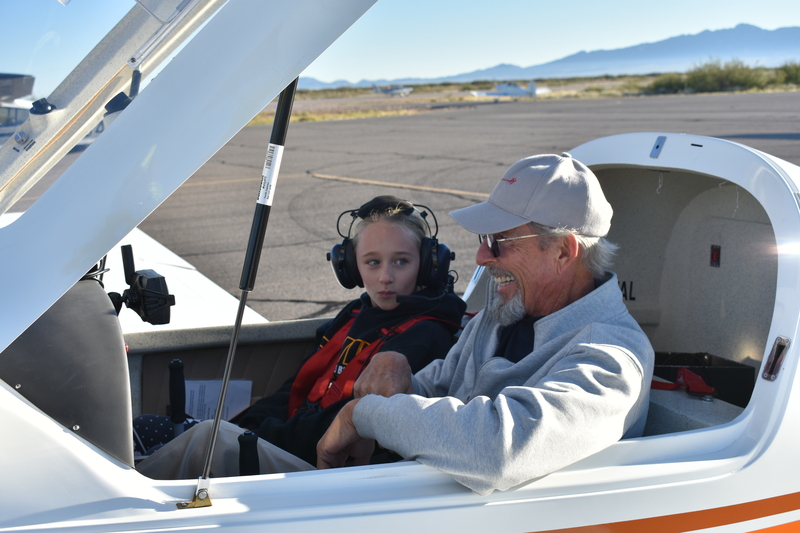 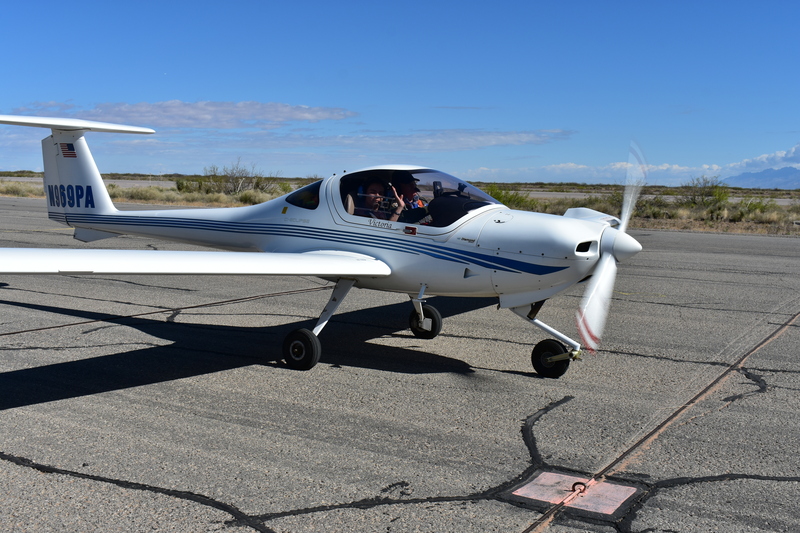 His Young Eagle securely belted in, Andy Werner, gets ready to start up his A240 Aerotek Light Sport Aircraft for their flight. 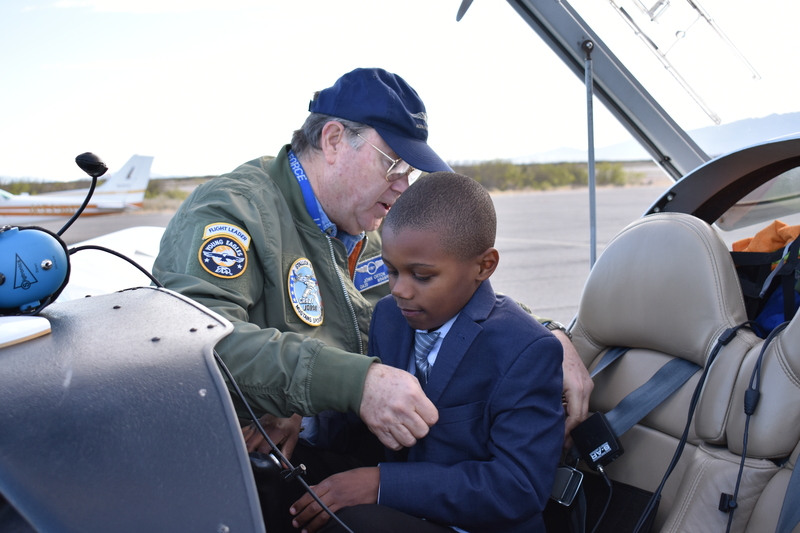 His Co-Pilot is already properly uniformed in his flight suit and aviator’s sunglasses. 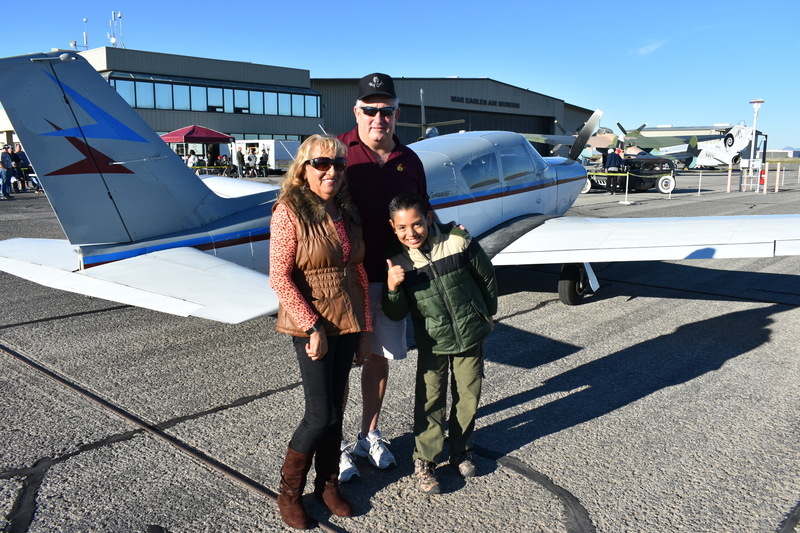 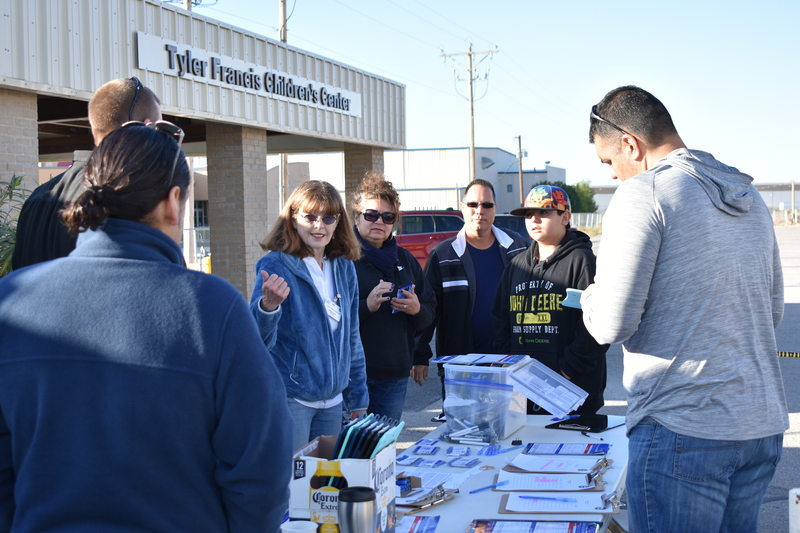 L to R: Yound Eagle to be, Michelle Hernandez’ mother, Adriana, takes photos of her daughter, while Volunteer, Charles Crawford looks on, while Michelle poses and Andy Werner describes his Chech built Light Sport airplane to Michelle’s Dad. 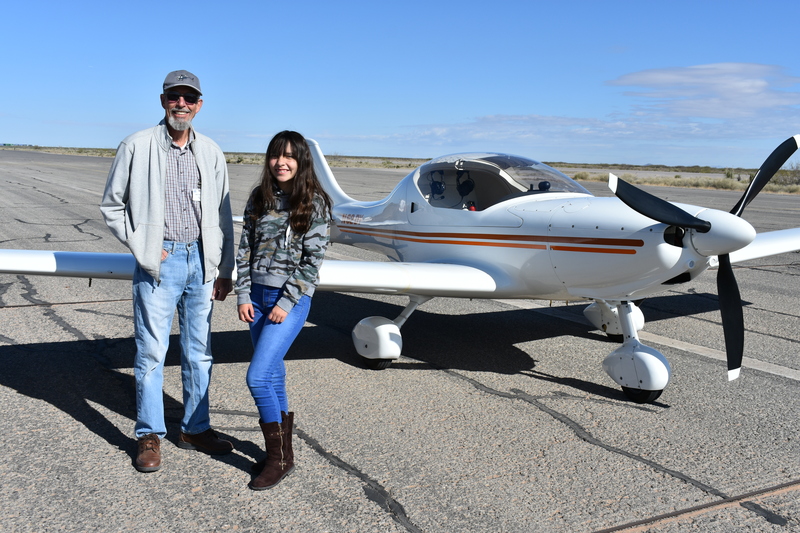 This entry was posted in AVIATION NEWS, HOT NEWS!, NEW VIDEOS and tagged Alex Gonzalez, Alfredo Vargas, Allan Yapor, Alondra Tinajero, Amna Noor, Andrea Rayos, Andy Werner, Bob Dockendorf, Bruce King, Charles Crawford, Daniel and Virgil Rayos, Dave Horsley, Dominic Austen, Dona Ana County International Jetport, EAA Chapter 1570, Elliot Werner, Jada and Aracely Gaton, Jim Foster, John Keithly, John Orton, John Signorino, Johnny Signorino, Jorge Vielledent, Juan Brito, Justin Walters, Kathleen Whelen, Kristopher Zapata, Kyle Olson, Larissa and Lorena Rodgriguez, Laura Ditlevson, Lewis Lawrence, Marcia McNamee, Marco Talamontes, Melinda Signorino, Melissa Keithly, Michelle and Adriano Hernandez, Mike McNamee, Nicholas and Virgil Pritchett, Oliver Oropeza, Ric Lambart, Rick King, Riley and Ruben Franco, RJ (Ruben) and Lisa Franco, Santa Teresa NM, Tom Holmsley, Tomas Peralta, Vincent and Philip Hardy, Yessenia Cano, Young Eagles Flight Program April 13 2019, Zion Hernandez on April 16, 2019 by FASFRIC.